In astroparticle physics, data analysis is a stepwise procedure, where one major step consists of a preselection of physically relevant signal examples from an overwhelming number of undesired background examples. This step generally requires estimated attributes of the examples like energy and direction. Based on these attributes, which are estimated in a first step, the separation of signal and background examples proceeds in a second step, resulting in a purified set of examples of certain signatures or particles well suited for specific physics analyses. Present telescopes do not require the data to be separated in real time. The next generation of experiments, however, requires a considerable acceleration of the procedures. The analysis is concluded in a third step, consisting in the solution of a specific inverse problem, like the reconstruction of source spectra. Simulated examples, which have to be produced in large numbers and with high precision, provide the basis for all of the aforementioned analysis steps. The next generation of large-scale telescopes in astronomy and astroparticle physics – CTA, SKA, and IceCube-Gen2 – is going to acquire data with a new level of precision and at an unprecedented data rate of up to 1 Petabyte per day. This exceptional data rate is more than a factor of 1000 above the present state of the art, necessitating the rejection of certain examples already during data acquisition. The fact that these experiments are not going to consist of single telescopes, but of large-scale telescope arrays, poses outstanding challenges to the analysis of data obtained with these experiments and offers groundbreaking insight into the physical mechanisms that underlie the observed astrophysical sources. Resource constraints arise from the data rate, the inherent limitations in telescope communication, and the isolated telescope sites, like for example the geographic South Pole in case of IceCube. In the third period, we intend not only to continue providing definite solutions in the construction phase of the experiments. Additionally, we intend to contribute to the solution of problems concerning communication, intelligent interaction, and the common data analysis chains of a multitude of flagship experiments. The extremely accurate application of Convolutional Neural Networks in IceCube will be extended to other use cases, and the new generation of telescope arrays will be investigated using probabilistic graphical models. The cost-effectiveness of data modeling and simulation will be improved by combining the different approaches of the second funding period. As an especially challenging but highly rewarding task, we will extend our efforts to include the data processing and analysis chains of the planned SKA radio telescope array, which will be by far the largest and most sensitive radio telescope ever constructed. The SKA will eventually have an effective area of about a square kilometer and facilitate not only unprecedented surveys of the radio sky to complement CTA and IceCube Gen-2, but also searches for low-frequency gravitational waves. It will deliver data at a rate of 3 TB per second already in its first phase, thus offering the greatest data processing challenge in physical sciences worldwide. Bunse/Piatkowski/2018a Bunse, Mirko and Piatkowski, Nico and Morik, Katharina. Towards a Unifying View on Deconvolution in Cherenkov Astronomy. In Gemulla, Rainer and Ponzetto, Simone Paolo and Bizer, Christian and Keuper, Margret and Stuckenschmidt, Heiner (editors), Lernen, Wissen, Daten, Analysen (LWDA) conference proceedings, Vol. 2191, pages 73--77, Gemulla, Rainer and Ponzetto, Simone Paolo and Bizer, Christian and Keuper, Margret and Stuckenschmidt, Heiner, 2018. Bunse/Piatkowski/2018b Bunse, Mirko and Piatkowski, Nico and Ruhe, Tim and Rhode, Wolfgang and Morik, Katharina. Unification of Deconvolution Algorithms for Cherenkov Astronomy. In 5th IEEE DSAA, 2018. Buschjaeger/Morik/2017b Buschjäger, Sebastian and Morik, Katharina. Decision Tree and Random Forest Implementations for Fast Filtering of Sensor Data. In IEEE Transactions on Circuits and Systems I: Regular Papers, Vol. 65-I, No. 1, pages 209--222, 2018. Flores/Huennefeld/2018a Flores, Anthony and Huennefeld, Mirco. RISE Germany Internship: Generative Neural Network Reconstruction of IceCube Cascade-like Events. No. 5, TU Dortmund, 2018. Ruhe/etal/2018b Ruhe, Tim and Schellenberg, Margarete and Spaan, Bernhard. Application of the Dortmund Spectrum Estimation Algorithm to LHCb Monte Carlo Simulations. No. 4, TU Dortmund, 2018. Aartsen/etal/2017a Aartsen, M.~G. and Ackermann, M. and Adams, J. and Aguilar, J.~A. and Ahlers, M. and Ahrens, M. and Samarai, I.~A. and Altmann, D. and Andeen, K. and et al.. A Search for Neutrino Emission from Fast Radio Bursts with Six Years of IceCube Data. In ArXiv e-prints, 2017. Aartsen/etal/2017b Aartsen, M.~G. and Hill, G.~C. and Kyriacou, A. and Robertson, S. and Wallace, A. and Whelan, B.~J. and Ackermann, M. and Bernardini, E. and Blot, S. and Bradascio, F. and et al.. Measurement of the multi-TeV neutrino interaction cross-section with IceCube using Earth absorption. In \nat, Vol. 551, pages 596-600, 2017. Aartsen/etal/2017c Aartsen, M.~G. and Ackermann, M. and Adams, J. and Aguilar, J.~A. and Ahlers, M. and Ahrens, M. and Samarai, I.~A. and Altmann, D. and et al.. The IceCube Neutrino Observatory - Contributions to ICRC 2017 Part VI: IceCube-Gen2, the Next Generation Neutrino Observatory. In ArXiv e-prints, 2017. Aartsen/etal/2017f Aartsen, M.~G. and Ackermann, M. and Adams, J. and Aguilar, J.~A. and Ahlers, M. and Ahrens, M. and Samarai, I.~A. and Altmann, D. and Andeen, K. and Anderson, T. and et al.. Extending the Search for Muon Neutrinos Coincident with Gamma-Ray Bursts in IceCube Data. In \apj, Vol. 843, pages 112, 2017. Aartsen/etal/2017j Aartsen, M.~G. and Ackermann, M. and Adams, J. and Aguilar, J.~A. and Ahlers, M. and Ahrens, M. and Samarai, I.~A. and Altmann, D. and Andeen, K. and Anderson, T. and et al.. Constraints on Galactic Neutrino Emission with Seven Years of IceCube Data. In \apj, Vol. 849, pages 67, 2017. Aartsen/etal/2017m Aartsen, M.~G. and Ackermann, M. and Adams, J. and Aguilar, J.~A. and Ahlers, M. and Ahrens, M. and Samarai, I.~A. and Altmann, D. and Andeen, K. and et al.. Neutrino Interferometry for High-Precision Tests of Lorentz Symmetry with IceCube. In ArXiv e-prints, 2017. Aartsen/etal/2017o Aartsen, M.~G. and Ackermann, M. and Adams, J. and Aguilar, J.~A. and Ahlers, M. and Ahrens, M. and Samarai, I.~A. and Altmann, D. and Andeen, K. and et al.. Measurement of Atmospheric Neutrino Oscillations at 6-56 GeV with IceCube DeepCore. In ArXiv e-prints, 2017. Aartsen/etal/2017r Aartsen, M.~G. and Ackermann, M. and Adams, J. and Aguilar, J.~A. and Ahlers, M. and Ahrens, M. and Al Samarai, I. and Altmann, D. and Andeen, K. and Anderson, T. and others. Measurement of the $\nu_\mu$ energy spectrum with IceCube-79. In European Physical Journal C, Vol. 77, pages #692, 2017. Aartsen/etal/2017s Aartsen, M.~G. and Ackermann, M. and Adams, J. and Aguilar, J.~A. and Ahlers, M. and Ahrens, M. and Samarai, I.~A. and Altmann, D. and Andeen, K. and et al.. The IceCube Neutrino Observatory - Contributions to ICRC 2017 Part V: Solar flares, Supernovae, Event reconstruction, Education \amp Outreach. In ArXiv e-prints, 2017. Aartsen/etal/2017t Aartsen, M.~G. and Ackermann, M. and Adams, J. and Aguilar, J.~A. and Ahlers, M. and Ahrens, M. and Samarai, I.~A. and Altmann, D. and Andeen, K. and et al.. The IceCube Neutrino Observatory - Contributions to ICRC 2017 Part IV: Searches for Beyond the Standard Model Physics. In ArXiv e-prints, 2017. Aartsen/etal/2017u Aartsen, M.~G. and Ackermann, M. and Adams, J. and Aguilar, J.~A. and Ahlers, M. and Ahrens, M. and Samarai, I.~A. and Altmann, D. and Andeen, K. and et al.. Search for Nonstandard Neutrino Interactions with IceCube DeepCore. In ArXiv e-prints, 2017. Aartsen/etal/2017w Aartsen, M.~G. and Ackermann, M. and Adams, J. and Aguilar, J.~A. and Ahlers, M. and Ahrens, M. and Samarai, I.~A. and Altmann, D. and Andeen, K. and Anderson, T. and et al.. Search for Astrophysical Sources of Neutrinos Using Cascade Events in IceCube. In \apj, Vol. 846, pages 136, 2017. Adam/etal/2017a Adam, J. and Ahnen, M.~L. and Baack, D. and Balbo, M. and Bergmann, M. and Biland, A. and Blank, M. and Bretz, T. and Bruegge, K.~A. and Buss, J. and Dmytriiev, A. and Domke, M. and Dorner, D. and Einecke, S. and Hempfling, C. and Hildebrand, D. and Hughes, G. and Linhoff, L. and Mannheim, K. and Mueller, S.~A. and Neise, D. and Neronov, A. and Noethe, M. and Paravac, A. and Pauss, F. and Rhode, W. and Shukla, A. and Temme, F. and Thaele, J. and Walter, R.. Mirror position determination for the alignment of Cherenkov Telescopes. In Nuclear Instruments and Methods in Physics Research A, Vol. 860, pages 1-5, 2017. Adam/etal/2017b Adam, J. and Buss, J. and Brügge, K. and Nöthe, M. and Rhode, W.. Cloud Detection and Prediction with All Sky Cameras. In European Physical Journal Web of Conferences, Vol. 144, pages 01004, 2017. Albert/etal/2017b Albert, A. and André, M. and Anghinolfi, M. and Ardid, M. and Aubert, J.-J. and Aublin, J. and Avgitas, T. and Baret, B. and Barrios-Martí, J. and Basa, S. and et al.. Search for High-energy Neutrinos from Binary Neutron Star Merger GW170817 with ANTARES, IceCube, and the Pierre Auger Observatory. In \apjl, Vol. 850, pages L35, 2017. Albert/etal/2017c Albert, A. and André, M. and Anghinolfi, M. and Anton, G. and Ardid, M. and Aubert, J.-J. and Avgitas, T. and Baret, B. and Barrios-Martí, J. and Basa, S. and et al.. Search for high-energy neutrinos from gravitational wave event GW151226 and candidate LVT151012 with ANTARES and IceCube. In \prd, Vol. 96, No. 2, pages 022005, 2017. Bieker/etal/2017a Bieker, Jacob and Börner, Mathis and Brügge, Kai and Nöthe, Maximillian. RISE Germany Internship: Unfolding FACT Data. TU Dortmund, 2017. Boerner/etal/2017a M. Börner and T. Hoinka and M. Meier and T. Menne and W. Rhode and K. Morik. Measurement/Simulation Mismatches and Multivariate Data Discretization in the Machine Learning Era. In Astronomical Data Analysis Software and Systems (ADASS XXVII), 2017. Bruegge/etal/2017a Br\"ugge, Kai and Egorov, Alexey and Bockermann, Christian and Morik, Katharina and Rhode, Wolfgang. Distributed Real-Time Data Stream Analysis for CTA. In ADASS XXVII, 2017. Bunse/etal/2017a Bunse, M. and Bockermann, C. and Buss, J. and Morik, K. and Rhode, W. and Ruhe, T.. Smart Control of Monte Carlo Simulations for Astroparticle Physics. In ADASS XXVII, 2017. Consortium/etal/2017a Cherenkov Telescope Array Consortium, T. and : and Acharya, B.~S. and Agudo, I. and Samarai, I.~A. and Alfaro, R. and Alfaro, J. and Alispach, C. and Alves Batista, R. and Amans, J.-P. and et al.. Science with the Cherenkov Telescope Array. In ArXiv e-prints, 2017. Dorner/etal/2017a Dorner, D. and Lauer, R.~J. and FACT Collaboration and Adam, J. and Ahnen, M. and Baack, D. and Balbo, M. and Bergmann, M. and Biland, A. and Blank, M. and Bretz, T. and Br\"ugge, K. and Buss, J. and Dmytiiev, A. and Einecke, S. and Hempfling, C. and Hildebrand, D. and Hughes, G. and Linhoff, L. and Mannheim, K. and M\"uller, S. and Neise, D. and Neronov, A. and Noethe, M. and Paravac, A. and Pauss, F. and Rhode, W. and Shukla, A. and Temme, F. and Thaele, J. and Walter, R. and HAWC Collaboration. First study of combined blazar light curves with FACT and HAWC. In Procs. of 6th GAMMA, Vol. 1792, 2017. Fuchs/etal/2017a Fuchs, T. and et al.. Development of a Machine Learning Based Analysis Chain for the Measurement of Atmospheric Muon Spectra with IceCube. In ArXiv e-prints, 2017. Huennefeld/2017a Hünnefeld, Mirco. Deep Learning in Physics Exemplified by the Reconstruction of Muon-Neutrino Events in IceCube. In International Cosmic Ray Conference (ICRC 2017), 2017. IceCube/etal/2017b Aartsen, M.~G. and Ackermann, M. and Adams, J. and Aguilar, J.~A. and Ahlers, M. and Ahrens, M. and Altmann, D. and Andeen, K. and Anderson, T. and Ansseau, I. and et al.. The IceCube realtime alert system. In Astroparticle Physics, Vol. 92, pages 30-41, 2017. IceCube/etal/2017e Aartsen, M.~G. and Ackermann, M. and Adams, J. and Aguilar, J.~A. and Ahlers, M. and Ahrens, M. and Altmann, D. and Andeen, K. and Anderson, T. and Ansseau, I. and et al.. The IceCube Neutrino Observatory: instrumentation and online systems. In Journal of Instrumentation, Vol. 12, pages P03012, 2017. IceCube/etal/2017g Aartsen, M.~G. and Ackermann, M. and Adams, J. and Aguilar, J.~A. and Ahlers, M. and Ahrens, M. and Altmann, D. and Andeen, K. and Anderson, T. and Ansseau, I. and et al.. Search for annihilating dark matter in the Sun with 3 years of IceCube data. In European Physical Journal C, Vol. 77, pages 146, 2017. IceCube/etal/2017h Aartsen, M.~G. and Abraham, K. and Ackermann, M. and Adams, J. and Aguilar, J.~A. and Ahlers, M. and Ahrens, M. and Altmann, D. and Andeen, K. and Anderson, T. and et al.. First search for dark matter annihilations in the Earth with the IceCube detector. In European Physical Journal C, Vol. 77, pages 82, 2017. IceCube/etal/2017i Aartsen, M.~G. and Abraham, K. and Ackermann, M. and Adams, J. and Aguilar, J.~A. and Ahlers, M. and Ahrens, M. and Altmann, D. and Andeen, K. and Anderson, T. and et al.. All-sky Search for Time-integrated Neutrino Emission from Astrophysical Sources with 7 yr of IceCube Data. In \apj, Vol. 835, pages 151, 2017. IceCube/etal/2017j Aartsen, M.~G. and Ackermann, M. and Adams, J. and Aguilar, J.~A. and Ahlers, M. and Ahrens, M. and Samarai, I.~A. and Altmann, D. and Andeen, K. and et al.. Neutrinos and Cosmic Rays Observed by IceCube. In ArXiv e-prints, 2017. IceCube/etal/2017k Aartsen, M.~G. and Abraham, K. and Ackermann, M. and Adams, J. and Aguilar, J.~A. and Ahlers, M. and Ahrens, M. and Altmann, D. and Andeen, K. and Anderson, T. and et al.. The Contribution of Fermi-2LAC Blazars to Diffuse TeV-PeV Neutrino Flux. In \apj, Vol. 835, pages 45, 2017. IceCube/etal/2017l Aartsen, M.~G. and Ackermann, M. and Adams, J. and Aguilar, J.~A. and Ahlers, M. and Ahrens, M. and Al Samarai, I. and Altmann, D. and Andeen, K. and et al.. Multiwavelength follow-up of a rare IceCube neutrino multiplet. In \aap, Vol. 607, pages A115, 2017. IceCube/etal/2017m Aartsen, M.~G. and Ackermann, M. and Adams, J. and Aguilar, J.~A. and Ahlers, M. and Ahrens, M. and Samarai, I.~A. and Altmann, D. and Andeen, K. and et al.. The IceCube Neutrino Observatory - Contributions to ICRC 2017 Part III: Cosmic Rays. In ArXiv e-prints, 2017. IceCube/etal/2017n Aartsen, M.~G. and Ackermann, M. and Adams, J. and Aguilar, J.~A. and Ahlers, M. and Ahrens, M. and Samarai, I.~A. and Altmann, D. and Andeen, K. and et al.. The IceCube Neutrino Observatory - Contributions to ICRC 2017 Part II: Properties of the Atmospheric and Astrophysical Neutrino Flux. In ArXiv e-prints, 2017. IceCube/etal/2017o Aartsen, M.~G. and Ackermann, M. and Adams, J. and Aguilar, J.~A. and Ahlers, M. and Ahrens, M. and Samarai, I.~A. and Altmann, D. and Andeen, K. and et al.. The IceCube Neutrino Observatory - Contributions to ICRC 2017 Part I: Searches for the Sources of Astrophysical Neutrinos. In ArXiv e-prints, 2017. IceCube/etal/2017p Aartsen, M.~G. and Ackermann, M. and Adams, J. and Aguilar, J.~A. and Ahlers, M. and Ahrens, M. and Al Samarai, I. and Altmann, D. and Andeen, K. and Anderson, T. and et al.. Search for neutrinos from dark matter self-annihilations in the center of the Milky Way with 3 years of IceCube/DeepCore. In European Physical Journal C, Vol. 77, pages 627, 2017. IceCube/etal/2017q Aartsen, M.~G. and Ackermann, M. and Adams, J. and Aguilar, J.~A. and Ahlers, M. and Ahrens, M. and Al Samarai, I. and Altmann, D. and Andeen, K. and Anderson, T. and et al.. Search for sterile neutrino mixing using three years of IceCube DeepCore data. In \prd, Vol. 95, No. 11, pages 112002, 2017. IceCube/etal/2017r Aartsen, M.~G. and Abraham, K. and Ackermann, M. and Adams, J. and Aguilar, J.~A. and Ahlers, M. and Ahrens, M. and Altmann, D. and Andeen, K. and Anderson, T. and et al.. PINGU: a vision for neutrino and particle physics at the South Pole. In Journal of Physics G Nuclear Physics, Vol. 44, No. 5, pages 054006, 2017. Liebig/etal/2017b Liebig, Thomas and Piatkowski, Nico and Bockermann, Christian and Morik, Katharina. Dynamic Route Planning with Real-Time Traffic Predictions. In Information Systems, Vol. 64, pages 258--265, Elsevier, 2017. Martin/2017a William Martin. RISE Germany Internship: Applying Deep Learning Methods to the Search for Astrophysical Tau Neutrinos. TU Dortmund, 2017. Morik/etal/2017a Morik, Katharina and Bockermann, Christian and Buschjäger, Sebastian. Big Data Science. In German journal on Artificial Intelligence (KI 2017), Vol. 32, No. 1, pages 27--36, 2017. Noethe/etal/2017a Nöthe, Maximilian and others. Measuring the Optical Point Spread Function of FACT Using the Cherenkov Camera. In Proceedings of the 35th International Cosmic Ray Conference (ICRC 2017), 35th International Cosmic Ray Conference (ICRC 2017), 2017. Noethe/etal/2017b Nöthe, Maximilian and others. FACT - Performance of the First Cherenkov Telescope Observing with SiPMs. In Proceedings of the 35th International Cosmic Ray Conference (ICRC 2017), 2017. Temme/etal/2017a Temme, F. and Adam, J. and Ahnen, M. and Baack, D. and Balbo, M. and Bergmann, M. and Biland, A. and Blank, M. and Bretz, T. and Brügge, K. and Buss, J. and Dmytriiev, A. and Dorner, D. and Einecke, S. and Hempfling, C. and Hildebrand, D. and Hughes, G. and Linhoff, L. and Mannheim, K. and Müller, S. and Neise, D. and Neronov, A. and Nöthe, M. and Paravac, A. and Pauss, F. and Rhode, W. and Shukla, A. and Thaele, J. and Walter, R.. Long-Term Monitoring of Bright Blazars in the Multi-GeV to TeV Range with FACT. In Galaxies, Vol. 5, pages 18, 2017. Aartsen/etal/2016a Aartsen, M.~G. and Abraham, K. and Ackermann, M. and Adams, J. and Aguilar, J.~A. and Ahlers, M. and Ahrens, M. and Altmann, D. and Andeen, K. and Anderson, T. and et al.. Constraints on Ultrahigh-Energy Cosmic-Ray Sources from a Search for Neutrinos above 10 PeV with IceCube. In Physical Review Letters, Vol. 117, No. 24, pages 241101, 2016. Aartsen/etal/2016c Aartsen, M.~G. and Abraham, K. and Ackermann, M. and Adams, J. and Aguilar, J.~A. and Ahlers, M. and Ahrens, M. and Altmann, D. and Andeen, K. and Anderson, T. and et al.. Observation and Characterization of a Cosmic Muon Neutrino Flux from the Northern Hemisphere Using Six Years of IceCube Data. In \apj, Vol. 833, pages 3, 2016. Aartsen/etal/2016d Aartsen, M.~G. and Abraham, K. and Ackermann, M. and Adams, J. and Aguilar, J.~A. and Ahlers, M. and Ahrens, M. and Altmann, D. and Andeen, K. and Anderson, T. and et al.. All-flavour search for neutrinos from dark matter annihilations in the Milky Way with IceCube/DeepCore. In European Physical Journal C, Vol. 76, pages 531, 2016. Aartsen/etal/2016e Aartsen, M.~G. and Abraham, K. and Ackermann, M. and Adams, J. and Aguilar, J.~A. and Ahlers, M. and Ahrens, M. and Altmann, D. and Andeen, K. and Anderson, T. and et al.. Searches for Sterile Neutrinos with the IceCube Detector. In Physical Review Letters, Vol. 117, No. 7, pages 071801, 2016. Aartsen/etal/2016f Aartsen, M.~G. and Abraham, K. and Ackermann, M. and Adams, J. and Aguilar, J.~A. and Ahlers, M. and Ahrens, M. and Altmann, D. and Anderson, T. and Ansseau, I. and et al.. Anisotropy in Cosmic-Ray Arrival Directions in the Southern Hemisphere Based on Six Years of Data from the IceCube Detector. In \apj, Vol. 826, pages 220, 2016. Aartsen/etal/2016g Aartsen, M.~G. and Abraham, K. and Ackermann, M. and Adams, J. and Aguilar, J.~A. and Ahlers, M. and Ahrens, M. and Altmann, D. and Anderson, T. and Ansseau, I. and et al.. Neutrino oscillation studies with IceCube-DeepCore. In Nuclear Physics B, Vol. 908, pages 161-177, 2016. Aartsen/etal/2016h Aartsen, M.~G. and Abraham, K. and Ackermann, M. and Adams, J. and Aguilar, J.~A. and Ahlers, M. and Ahrens, M. and Altmann, D. and Andeen, K. and Anderson, T. and et al.. Lowering IceCube's Energy Threshold for Point Source Searches in the Southern Sky. In \apjl, Vol. 824, pages L28, 2016. Aartsen/etal/2016i Aartsen, M.~G. and Abraham, K. and Ackermann, M. and Adams, J. and Aguilar, J.~A. and Ahlers, M. and Ahrens, M. and Altmann, D. and Anderson, T. and Ansseau, I. and et al.. An All-sky Search for Three Flavors of Neutrinos from Gamma-ray Bursts with the IceCube Neutrino Observatory. In \apj, Vol. 824, pages 115, 2016. Aartsen/etal/2016j Aartsen, M.~G. and Abraham, K. and Ackermann, M. and Adams, J. and Aguilar, J.~A. and Ahlers, M. and Ahrens, M. and Altmann, D. and Anderson, T. and Archinger, M. and et al.. Characterization of the atmospheric muon flux in IceCube. In Astroparticle Physics, Vol. 78, pages 1-27, 2016. Aartsen/etal/2016k Aartsen, M.~G. and Abraham, K. and Ackermann, M. and Adams, J. and Aguilar, J.~A. and Ahlers, M. and Ahrens, M. and Altmann, D. and Anderson, T. and Ansseau, I. and et al.. Improved limits on dark matter annihilation in the Sun with the 79-string IceCube detector and implications for supersymmetry. In \jcap, Vol. 4, pages 022, 2016. Aartsen/etal/2016l Aartsen, M.~G. and Abraham, K. and Ackermann, M. and Adams, J. and Aguilar, J.~A. and Ahlers, M. and Ahrens, M. and Altmann, D. and Anderson, T. and Ansseau, I. and et al.. Searches for relativistic magnetic monopoles in IceCube. In European Physical Journal C, Vol. 76, pages 133, 2016. Aartsen/etal/2016m Aartsen, M.~G. and Abraham, K. and Ackermann, M. and Adams, J. and Aguilar, J.~A. and Ahlers, M. and Ahrens, M. and Altmann, D. and Anderson, T. and Ansseau, I. and et al.. Search for astrophysical tau neutrinos in three years of IceCube data. In \prd, Vol. 93, No. 2, pages 022001, 2016. Aartsen/etal/2016n Aartsen, M.~G. and Abraham, K. and Ackermann, M. and Adams, J. and Aguilar, J.~A. and Ahlers, M. and Ahrens, M. and Altmann, D. and Anderson, T. and Ansseau, I. and et al.. The Search for Transient Astrophysical Neutrino Emission with IceCube-DeepCore. In \apj, Vol. 816, pages 75, 2016. Abbas/etal/2016a Sermad Abbas and Roland Fried and Ursula Gather. Detection of Local Intensity Changes in Grayscale Images with Robust Methods for Time-Series Analysis. In Solving Large Scale Learning Tasks. Challenges and Algorithms - Essays Dedicated to Katharina Morik on the Occasion of Her 60th Birthday, pages 251--271, 2016. Abchiche/etal/2016a CTA Consortium, T. and : and Abchiche, A. and Abeysekara, U. and Abril, Ó. and Acero, F. and Acharya, B.~S. and Adams, C. and Agnetta, G. and Aharonian, F. and et al.. Contributions of the Cherenkov Telescope Array (CTA) to the 6th International Symposium on High-Energy Gamma-Ray Astronomy (Gamma 2016). In ArXiv e-prints, 2016. AdrianMartinez/etal/2016c Adrián-Martínez, S. and Albert, A. and André, M. and Anton, G. and Ardid, M. and Aubert, J.-J. and Baret, B. and Barrios-Martí, J. and Basa, S. and Bertin, V. and et al.. The First Combined Search for Neutrino Point-sources in the Southern Hemisphere with the ANTARES and IceCube Neutrino Telescopes. In \apj, Vol. 823, pages 65, 2016. AdrianMartinez/etal/2016e Adrián-Martínez, S. and Albert, A. and André, M. and Anghinolfi, M. and Anton, G. and Ardid, M. and Aubert, J.-J. and Avgitas, T. and Baret, B. and Barrios-Martí, J. and et al.. High-energy neutrino follow-up search of gravitational wave event GW150914 with ANTARES and IceCube. In \prd, Vol. 93, No. 12, pages 122010, 2016. Ahnen/etal/2016a Ahnen, M.~L. and Ansoldi, S. and Antonelli, L.~A. and Antoranz, P. and Babic, A. and Banerjee, B. and Bangale, P. and Barres de Almeida, U. and Barrio, J.~A. and Becerra González, J. and Bednarek, W. and Bernardini, E. and Biasuzzi, B. and Bil, A. and Blanch, O. and Bonnefoy, S. and Bonnoli, G. and Borracci, F. and Bretz, T. and Carmona, E. and Carosi, A. and Chatterjee, A. and Clavero, R. and Colin, P. and Colombo, E. and Contreras, J.~L. and Cortina, J. and Covino, S. and Da Vela, P. and Dazzi, F. and De Angelis, A. and De Lotto, B. and Wilhelmi, E.~d.~O. and Delgado Mendez, C. and Di Pierro, F. and Dominis Prester, D. and Dorner, D. and Doro, M. and Einecke, S. and Eisenacher Glawion, D. and Elsaesser, D. and Fernández-Barral, A. and Fidalgo, D. and Fonseca, M.~V. and Font, L. and Frantzen, K. and Fruck, C. and Galindo, D. and García López, R.~J. and Garczarczyk, M. and Garrido Terrats, D. and Gaug, M. and Giammaria, P. and Godinovic, N. and González Muñoz, A. and Guberman, D. and Hahn, A. and Hanabata, Y. and Hayashida, M. and Herrera, J. and Hose, J. and Hrupec, D. and Hughes, G. and Idec, W. and Kodani, K. and Konno, Y. and Kubo, H. and Kushida, J. and La Barbera, A. and Lelas, D. and Lindfors, E. and Lombardi, S. and Longo, F. and López, M. and López-Coto, R. and López-Oramas, A. and Lorenz, E. and Majumdar, P. and Makariev, M. and Mallot, K. and Maneva, G. and Manganaro, M. and Mannheim, K. and Maraschi, L. and Marcote, B. and Mariotti, M. and Martínez, M. and Mazin, D. and Menzel, U. and Mira, J.~M. and Mirzoyan, R. and Moralejo, A. and Moretti, E. and Nakajima, D. and Neustroev, V. and Niedzwiecki, A. and Nievas Rosillo, M. and Nilsson, K. and Nishijima, K. and Noda, K. and Orito, R. and Overkemping, A. and Paiano, S. and Palacio, J. and Palatiello, M. and Paneque, D. and Paoletti, R. and Paredes, J.~M. and Paredes-Fortuny, X. and Persic, M. and Poutanen, J. and Prada Moroni, P.~G. and Prini, E. and Puljak, I. and Rhode, W. and Ribó, M. and Rico, J. and Rodriguez Garcia, J. and Saito, T. and Satalecka, K. and Schultz, C. and Schweizer, T. and Shore, S.~N. and Sillanpaa, A. and Sitarek, J. and Snidaric, I. and Sobczynska, D. and Stamerra, A. and Steinbring, T. and Strzys, M. and Takalo, L. and Takami, H. and Tavecchio, F. and Temnikov, P. and Terzic, T. and Tescaro, D. and Teshima, M. and Thaele, J. and Torres, D.~F. and Toyama, T. and Treves, A. and Verguilov, V. and Vovk, I. and Ward, J.~E. and Will, M. and Wu, M.~H. and Zanin, R.. MAGIC observations of the February 2014 flare of 1ES 1011+496 and ensuing constraint of the EBL density. In ArXiv e-prints, 2016. Ahnen/etal/2016b Ahnen, M.~L. and Baack, D. and Balbo, M. and Bergmann, M. and Biland, A. and Blank, M. and Bretz, T. and Bruegge, K.~A. and Buss, J. and Domke, M. and Dorner, D. and Einecke, S. and Hempfling, C. and Hildebrand, D. and Hughes, G. and Lustermann, W. and Mannheim, K. and Mueller, S.~A. and Neise, D. and Neronov, A. and Noethe, M. and Overkemping, A.-K. and Paravac, A. and Pauss, F. and Rhode, W. and Shukla, A. and Temme, F. and Thaele, J. and Toscano, S. and Vogler, P. and Walter, R. and Wilbert, A.. Bokeh mirror alignment for Cherenkov telescopes. In Astroparticle Physics, Vol. 82, pages 1-9, 2016. Ahnen/etal/2016d Ahnen, M.~L. and Baack, D. and Balbo, M. and Bergmann, M. and Biland, A. and Blank, M. and Bretz, T. and Bruegge, K.~A. and Buss, J. and Domke, M. and Dorner, D. and Einecke, S. and Hempfling, C. and Hildebrand, D. and Hughes, G. and Lustermann, W. and Mannheim, K. and Mueller, S.~A. and Neise, D. and Neronov, A. and Noethe, M. and Overkemping, A.-K. and Paravac, A. and Pauss, F. and Rhode, W. and Shukla, A. and Temme, F. and Thaele, J. and Toscano, S. and Vogler, P. and Walter, R. and Wilbert, A.. Normalized and asynchronous mirror alignment for Cherenkov telescopes. In Astroparticle Physics, Vol. 82, pages 56-65, 2016. Aleksic/etal/2016a Aleksi\'c, J. and Ansoldi, S. and Antonelli, L.~A. and Antoranz, P. and Arcaro, C. and Babic, A. and Bangale, P. and Barres de Almeida, U. and Barrio, J.~A. and Becerra González, J. and Bednarek, W. and Bernardini, E. and Biasuzzi, B. and Biland, A. and Blanch, O. and Bonnefoy, S. and Bonnoli, G. and Borracci, F. and Bretz, T. and Carmona, E. and Carosi, A. and Colin, P. and Colombo, E. and Contreras, J.~L. and Cortina, J. and Covino, S. and Da Vela, P. and Dazzi, F. and De Angelis, A. and De Caneva, G. and De Lotto, B. and Wilhelmi, E.~d.~O.~n. and Delgado Mendez, C. and Di Pierro, F. and Dominis Prester, D. and Dorner, D. and Doro, M. and Einecke, S. and Eisenacher, D. and Elsaesser, D. and Fernández-Barral, A. and Fidalgo, D. and Fonseca, M.~V. and Font, L. and Frantzen, K. and Fruck, C. and Galindo, D. and García López, R.~J. and Garczarczyk, M. and Garrido Terrats, D. and Gaug, M. and Godinovi\'c, N. and noz, A.~G.~M. and Gozzini, S.~R. and Hadasch, D. and Hanabata, Y. and Hayashida, M. and Herrera, J. and Hose, J. and Hrupec, D. and Idec, W. and Kadenius, V. and Kellermann, H. and Knoetig, M.~L. and Kodani, K. and Konno, Y. and Krause, J. and Kubo, H. and Kushida, J. and La Barbera, A. and Lelas, D. and Lewandowska, N. and Lindfors, E. and Lombardi, S. and Longo, F. and López, M. and López-Coto, R. and López-Oramas, A. and Lorenz, E. and Lozano, I. and Makariev, M. and Mallot, K. and Maneva, G. and Mannheim, K. and Maraschi, L. and Marcote, B. and Mariotti, M. and Martínez, M. and Mazin, D. and Menzel, U. and Miranda, J.~M. and Mirzoyan, R. and Moralejo, A. and Munar-Adrover, P. and Nakajima, D. and Neustroev, V. and Niedzwiecki, A. and Nievas Rosillo, M. and Nilsson, K. and Nishijima, K. and Noda, K. and Orito, R. and Overkemping, A. and Paiano, S. and Palatiello, M. and Paneque, D. and Paoletti, R. and Paredes, J.~M. and Paredes-Fortuny, X. and Persic, M. and Poutanen, J. and Prada Moroni, P.~G. and Prandini, E. and Puljak, I. and Reinthal, R. and Rhode, W. and Ribó, M. and Rico, J. and Rodriguez Garcia, J. and Saito, T. and Saito, K. and Satalecka, K. and Scalzotto, V. and Scapin, V. and Schweizer, T. and Shore, S.~N. and Sillanpää, A. and Sitarek, J. and Snidaric, I. and Sobczynska, D. and Stamerra, A. and Steinbring, T. and Strzys, M. and Takalo, L. and Takami, H. and Tavecchio, F. and Temnikov, P. and Terzi\'c, T. and Tescaro, D. and Teshima, M. and Thaele, J. and Torres, D.~F. and Toyama, T. and Treves, A. and Vogler, P. and Will, M. and Zanin, R. and Buson, S. and D'Ammando, F. and Lähteenmäki, A. and Hovatta, T. and Kovalev, Y.~Y. and Lister, M.~L. and Max-Moerbeck, W. and Mundell, C. and Pushkarev, A.~B. and Rastorgueva-Foi, E. and Readhead, A.~C.~S. and Richards, J.~L. and Tammi, J. and Sanchez, D.~A. and Tornikoski, M. and Savolainen, T. and Steele, I.. Insights into the emission of the blazar 1ES 1011+496 through unprecedented broadband observations during 2011 and 2012. In ArXiv e-prints, 2016. Aleksic/etal/2016b Aleksi\'c, J. and Ansoldi, S. and Antonelli, L.~A. and Antoranz, P. and Babic, A. and Bangale, P. and Barceló, M. and Barrio, J.~A. and Becerra González, J. and Bednarek, W. and Bernardini, E. and Biasuzzi, B. and Biland, A. and Bitossi, M. and Blanch, O. and Bonnefoy, S. and Bonnoli, G. and Borracci, F. and Bretz, T. and Carmona, E. and Carosi, A. and Cecchi, R. and Colin, P. and Colombo, E. and Contreras, J.~L. and Corti, D. and Cortina, J. and Covino, S. and Da Vela, P. and Dazzi, F. and De Angelis, A. and De Caneva, G. and De Lotto, B. and de Oña Wilhelmi, E. and Delgado Mendez, C. and Dettlaff, A. and Dominis Prester, D. and Dorner, D. and Doro, M. and Einecke, S. and Eisenacher, D. and Elsaesser, D. and Fidalgo, D. and Fink, D. and Fonseca, M.~V. and Font, L. and Frantzen, K. and Fruck, C. and Galindo, D. and García López, R.~J. and Garczarczyk, M. and Garrido Terrats, D. and Gaug, M. and Giavitto, G. and Godinovi\'c, N. and González Muñoz, A. and Gozzini, S.~R. and Haberer, W. and Hadasch, D. and Hanabata, Y. and Hayashida, M. and Herrera, J. and Hildebrand, D. and Hose, J. and Hrupec, D. and Idec, W. and Illa, J.~M. and Kadenius, V. and Kellermann, H. and Knoetig, M.~L. and Kodani, K. and Konno, Y. and Krause, J. and Kubo, H. and Kushida, J. and La Barbera, A. and Lelas, D. and Lemus, J.~L. and Lewandowska, N. and Lindfors, E. and Lombardi, S. and Longo, F. and López, M. and López-Coto, R. and López-Oramas, A. and Lorca, A. and Lorenz, E. and Lozano, I. and Makariev, M. and Mallot, K. and Maneva, G. and Mankuzhiyil, N. and Mannheim, K. and Maraschi, L. and Marcote, B. and Mariotti, M. and Martínez, M. and Mazin, D. and Menzel, U. and Miranda, J.~M. and Mirzoyan, R. and Moralejo, A. and Munar-Adrover, P. and Nakajima, D. and Negrello, M. and Neustroev, V. and Niedzwiecki, A. and Nilsson, K. and Nishijima, K. and Noda, K. and Orito, R. and Overkemping, A. and Paiano, S. and Palatiello, M. and Paneque, D. and Paoletti, R. and Paredes, J.~M. and Paredes-Fortuny, X. and Persic, M. and Poutanen, J. and Prada Moroni, P.~G. and Prandini, E. and Puljak, I. and Reinthal, R. and Rhode, W. and Ribó, M. and Rico, J. and Rodriguez Garcia, J. and Rügamer, S. and Saito, T. and Saito, K. and Satalecka, K. and Scalzotto, V. and Scapin, V. and Schultz, C. and Schlammer, J. and Schmidl, S. and Schweizer, T. and Shore, S.~N. and Sillanpää, A. and Sitarek, J. and Snidaric, I. and Sobczynska, D. and Spanier, F. and Stamerra, A. and Steinbring, T. and Storz, J. and Strzys, M. and Takalo, L. and Takami, H. and Tavecchio, F. and Tejedor, L.~A. and Temnikov, P. and Terzi\'c, T. and Tescaro, D. and Teshima, M. and Thaele, J. and Tibolla, O. and Torres, D.~F. and Toyama, T. and Treves, A. and Vogler, P. and Wetteskind, H. and Will, M. and Zanin, R.. The major upgrade of the MAGIC telescopes, Part II: A performance study using observations of the Crab Nebula. In Astroparticle Physics, Vol. 72, pages 76-94, 2016. Baack/2016a Baack, Dominik. Data Reduction for CORSIKA. No. 2, E5b, Faculty Physic, TU Dortmund, 2016.
bhasin/2016b Srishti Bhasin, Mathis Börner. RISE Germany Internship: Application of Data Mining Methods on IceCube Event Reconstructions. No. 6, TU Dortmund, 2016. Biland/etal/2016a Biland, A. and Adam, J. and Ahnen, M.~L. and Baack, D. and Balbo, M. and Bergmann, M. and Blank, M. and Bretz, T. and Brügge, K.~A. and Buss, J. and Dmytriiev, A. and Dorner, D. and Einecke, S. and Hempfling, C. and Hildebrand, D. and Hughes, G. and Linhoff, L. and Mannheim, K. and Müller, S. and Neise, D. and Neronov, A. and Nöthe, M. and Paravac, A. and Pauss, F. and Rhode, W. and Shukla, A. and Temme, F. and Thaele, J. and Walter, R.. FACT: status and experience from four years of operation of the first G-APD Cherenkov Telescope. In Ground-based and Airborne Telescopes VI, Vol. 9906, pages 99061A, 2016. Buss/etal/2016a Buss, Jens and Bockermann, Christian and Morik, Katharina and Rhode, Wolfgang and Ruhe, Tim. 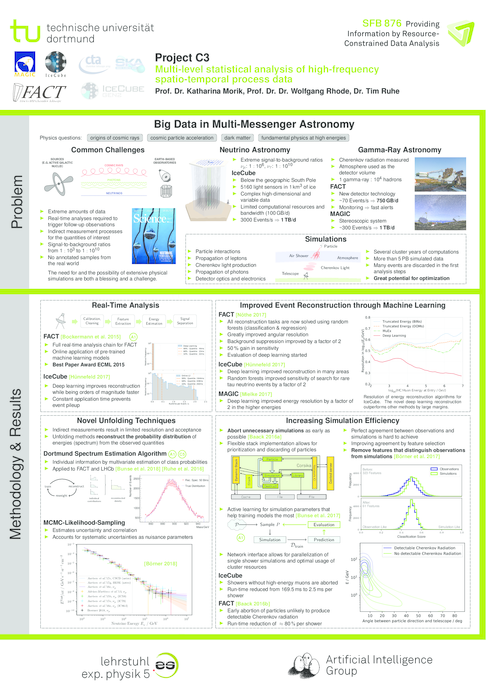 FACT-Tools -- Processing High-Volume Telescope Data. In Astronomical Data Analysis Software and Systems (ADASS XXVI), 2016. Collaboration/etal/2016a The MAGIC Collaboration and Ahnen, M.~L. and Ansoldi, S. and Antonelli, L.~A. and Antoranz, P. and Babic, A. and Banerjee, B. and Bangale, P. and Barres de Almeida, U. and Barrio, J.~A. and Becerra Gonzalez, J. and Bednarek, W. and Bernardini, E. and Biasuzzi, B. and Biland, A. and Blanch, O. and Bonnefoy, S. and Bonnoli, G. and Borracci, F. and Bretz, T. and Carmona, E. and Carosi, A. and Chatterjee, A. and Clavero, R. and Colin, P. and Colombo, E. and Contreras, J.~L. and Cortina, J. and Covino, S. and Da Vela, P. and Dazzi, F. and De Angelis, A. and De Caneva, G. and De Lotto, B. and de Ona Wilhelmi, E. and Delgado Mendez, C. and Di Pierro, F. and Dominis Prester, D. and Dorner, D. and Doro, M. and Einecke, S. and Elsaesser, D. and Fernandez-Barral, A. and Fidalgo, D. and Fonseca, M.~V. and Font, L. and Frantzen, K. and Fruck, C. and Galindo, D. and Garcia Lopez, R.~J. and Garczarczyk, M. and Garrido Terrats, D. and Gaug, M. and Giammaria, P. and Glawion, D. and Godinovic, N. and Gonzalez Munoz, A. and Guberman, D. and Hanabata, Y. and Hayashida, M. and Herrera, J. and Hose, J. and Hrupec, D. and Hughes, G. and Idec, W. and Kodani, K. and Konno, Y. and Kubo, H. and Kushida, J. and La Barbera, A. and Lelas, D. and Lindfors, E. and Lombardi, S. and Longo, F. and Lopez, M. and Lopez-Coto, R. and Lopez-Oramas, A. and Lorenz, E. and Majumdar, P. and Makariev, M. and Mallot, K. and Maneva, G. and Manganaro, M. and Mannheim, K. and Maraschi, L. and Marcote, B. and Mariotti, M. and Martinez, M. and Mazin, D. and Menzel, U. and Miranda, J.~M. and Mirzoyan, R. and Moralejo, A. and Nakajima, D. and Neustroev, V. and Niedzwiecki, A. and Nievas Rosillo, M. and Nilsson, K. and Nishijima, K. and Noda, K. and Orito, R. and Overkemping, A. and Paiano, S. and Palacio, J. and Palatiello, M. and Paneque, D. and Paoletti, R. and Paredes, J.~M. and Paredes-Fortuny, X. and Persic, M. and Poutanen, J. and Prada Moroni, P.~G. and Prandini, E. and Puljak, I. and Reinthal, R. and Rhode, W. and Ribo, M. and Rico, J. and Rodriguez Garcia, J. and Rugamer, S. and Saito, T. and Satalecka, K. and Scapin, V. and Schultz, C. and Schweizer, T. and Shore, S.~N. and Sillanpaa, A. and Sitarek, J. and Snidaric, I. and Sobczynska, D. and Stamerra, A. and Steinbring, T. and Strzys, M. and Takalo, L. and Takami, H. and Tavecchio, F. and Temnikov, P. and Terzic, T. and Tescaro, D. and Teshima, M. and Thaele, J. and Torres, D.~F. and Toyama, T. and Treves, A. and Verguilov, V. and Vovk, I. and Ward, J.~E. and Will, M. and Wu, M.~H. and Zanin, R. and Lucarelli, F. and Pittori, C. and S.~Vercellone for the AGILE team and Berdyugin, A. and Carini, M.~T. and Lahteenmaki, A. and Pasanen, M. and Pease, A. and Sainio, J. and Tornikoski, M. and Walters, R.. Multi-Wavelength Observations of the Blazar 1ES 1011+496 in Spring 2008. In ArXiv e-prints, 2016. PG594/2016a Mohamed Asmi and Alexander Bainczyk and Mirko Bunse and Dennis Gaidel and Michael May and Christian Pfeiffer and Alexander Schieweck and Lea Schönberger and Karl Stelzner and David Sturm and Carolin Wiethoff and Lili Xu. PG594 -- Big Data. No. 5, TU Dortmund, 2016. PierreAugerCollaboration/2016a Pierre Auger Collaboration and Telescope Array Collaboration. Search for correlations between the arrival directions of IceCube neutrino events and ultrahigh-energy cosmic rays detected by the Pierre Auger Observatory and the Telescope Array. In \jcap, Vol. 1, pages 037, 2016. Ruhe/2016a Ruhe, Tim. Application of Data Mining Techniques in Atmospheric Neutrino Analyses with IceCube. In European Physical Journal Web of Conferences, 2016. Ruhe/2016b Ruhe, T.. Application of data mining techniques in atmospheric neutrino analyses with IceCube. In European Physical Journal Web of Conferences, Vol. 116, pages 07006, 2016. Ruhe/etal/2016c Ruhe, T. and Börner, M. and Wornowizki, M. and Voigt, T. and Rhode, W. and Morik, K.. Mining for Spectra -- The Dortmund Spectrum Estimation Algorithm. In Astronomical Data Analysis Software and Systems (ADASS XXVI), 2016. Ruhe/etal/2016d Ruhe, T. and Scheriau, F. and Schmitz, M.. Measurement of the atmospheric muon neutrino energy spectrum with IceCube in the 79- and 86-String configuration. In European Physical Journal Web of Conferences, Vol. 116, pages 08004, 2016. Aartsen/etal/2015a Aartsen, M.~G. and Abraham, K. and Ackermann, M. and Adams, J. and Aguilar, J.~A. and Ahlers, M. and Ahrens, M. and Altmann, D. and Anderson, T. and Archinger, M. and et al.. A Combined Maximum-likelihood Analysis of the High-energy Astrophysical Neutrino Flux Measured with IceCube. In \apj, Vol. 809, pages 98, 2015. Aartsen/etal/2015b Aartsen, M.~G. and Ackermann, M. and Adams, J. and Aguilar, J.~A. and Ahlers, M. and Ahrens, M. and Altmann, D. and Anderson, T. and Archinger, M. and Arguelles, C. and et al.. Searches for Time-dependent Neutrino Sources with IceCube Data from 2008 to 2012. In \apj, Vol. 807, pages 46, 2015. Aartsen/etal/2015c Aartsen, M.~G. and Abraham, K. and Ackermann, M. and Adams, J. and Aguilar, J.~A. and Ahlers, M. and Ahrens, M. and Altmann, D. and Anderson, T. and Archinger, M. and et al.. Search for dark matter annihilation in the Galactic Center with IceCube-79. In European Physical Journal C, Vol. 75, pages 492, 2015. Aartsen/etal/2015d Aartsen, M.~G. and Abraham, K. and Ackermann, M. and Adams, J. and Aguilar, J.~A. and Ahlers, M. and Ahrens, M. and Altmann, D. and et al.. IceCube-Gen2 - The Next Generation Neutrino Observatory at the South Pole: Contributions to ICRC 2015. In ArXiv e-prints, 2015. Aartsen/etal/2015e Aartsen, M.~G. and Ackermann, M. and Adams, J. and Aguilar, J.~A. and Ahlers, M. and Ahrens, M. and Altmann, D. and Anderson, T. and Arguelles, C. and Arlen, T.~C. and others. Development of a general analysis and unfolding scheme and its application to measure the energy spectrum of atmospheric neutrinos with IceCube. In European Physical Journal C, Vol. 75, pages 116, 2015. Aartsen/etal/2015g Aartsen, M.~G. and Abraham, K. and Ackermann, M. and Adams, J. and Aguilar, J.~A. and Ahlers, M. and Ahrens, M. and Altmann, D. and Anderson, T. and et al.. The IceCube Neutrino Observatory - Contributions to ICRC 2015 Part III: Cosmic Rays. In ArXiv e-prints, 2015. Aartsen/etal/2015h Aartsen, M.~G. and Abraham, K. and Ackermann, M. and Adams, J. and Aguilar, J.~A. and Ahlers, M. and Ahrens, M. and Altmann, D. and Anderson, T. and et al.. The IceCube Neutrino Observatory - Contributions to ICRC 2015 Part II: Atmospheric and Astrophysical Diffuse Neutrino Searches of All Flavors. In ArXiv e-prints, 2015. Aartsen/etal/2015i Aartsen, M.~G. and Abraham, K. and Ackermann, M. and Adams, J. and Aguilar, J.~A. and Ahlers, M. and Ahrens, M. and Altmann, D. and Anderson, T. and et al.. 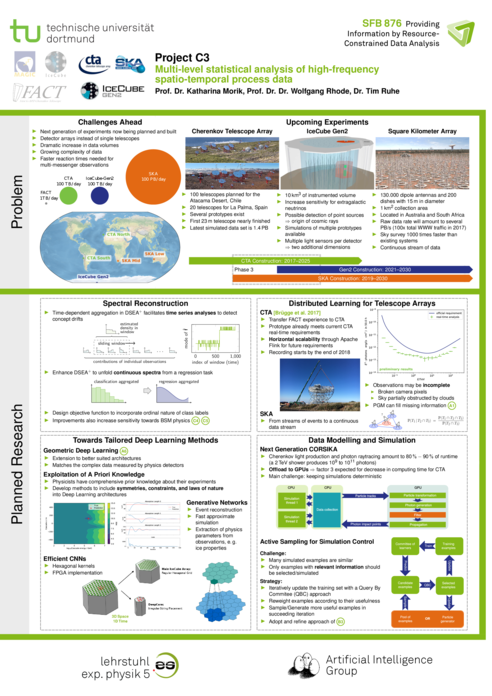 The IceCube Neutrino Observatory - Contributions to ICRC 2015 Part I: Point Source Searches. In ArXiv e-prints, 2015. Aartsen/etal/2015j Aartsen, M.~G. and Abraham, K. and Ackermann, M. and Adams, J. and Aguilar, J.~A. and Ahlers, M. and Ahrens, M. and Altmann, D. and Anderson, T. and Archinger, M. and et al.. The Detection of a Type IIn Supernova in Optical Follow-up Observations of IceCube Neutrino Events. In \apj, Vol. 811, pages 52, 2015. Aartsen/etal/2015k Aartsen, M.~G. and Abraham, K. and Ackermann, M. and Adams, J. and Aguilar, J.~A. and Ahlers, M. and Ahrens, M. and Altmann, D. and Anderson, T. and et al.. The IceCube Neutrino Observatory - Contributions to ICRC 2015 Part IV: Searches for Dark Matter and Exotic Particles. In ArXiv e-prints, 2015. Aartsen/etal/2015l Aartsen, M.~G. and Ackermann, M. and Adams, J. and Aguilar, J.~A. and Ahlers, M. and Ahrens, M. and Altmann, D. and Anderson, T. and Archinger, M. and Arguelles, C. and et al.. Measurement of the Atmospheric $\nu$$_e$ Spectrum with IceCube. In \prd, Vol. 91, No. 12, pages 122004, 2015. Aartsen/etal/2015m Aartsen, M.~G. and Ackermann, M. and Adams, J. and Aguilar, J.~A. and Ahlers, M. and Ahrens, M. and Altmann, D. and Anderson, T. and Arguelles, C. and Arlen, T.~C. and et al.. Searches for small-scale anisotropies from neutrino point sources with three years of IceCube data. In Astroparticle Physics, Vol. 66, pages 39-52, 2015. Aartsen/etal/2015n Aartsen, M.~G. and Ackermann, M. and Adams, J. and Aguilar, J.~A. and Ahlers, M. and Ahrens, M. and Altmann, D. and Anderson, T. and Arguelles, C. and Arlen, T.~C. and et al.. Search for Prompt Neutrino Emission from Gamma-Ray Bursts with IceCube. In \apjl, Vol. 805, pages L5, 2015. Aartsen/etal/2015o Aartsen, M.~G. and Ackermann, M. and Adams, J. and Aguilar, J.~A. and Ahlers, M. and Ahrens, M. and Altmann, D. and Anderson, T. and Arguelles, C. and Arlen, T.~C. and et al.. Atmospheric and astrophysical neutrinos above 1 TeV interacting in IceCube. In \prd, Vol. 91, No. 2, pages 022001, 2015. Aartsen/etal/2015p Aartsen, M.~G. and Ackermann, M. and Adams, J. and Aguilar, J.~A. and Ahlers, M. and Ahrens, M. and Altmann, D. and Anderson, T. and Arguelles, C. and Arlen, T.~C. and et al.. Flavor Ratio of Astrophysical Neutrinos above 35 TeV in IceCube. In Physical Review Letters, Vol. 114, No. 17, pages 171102, 2015. Aartsen/etal/2015r Aartsen, M.~G. and Ackermann, M. and Adams, J. and Aguilar, J.~A. and Ahlers, M. and Ahrens, M. and Altmann, D. and Anderson, T. and Arguelles, C. and Arlen, T.~C. and et al.. Determining neutrino oscillation parameters from atmospheric muon neutrino disappearance with three years of IceCube DeepCore data. In \prd, Vol. 91, No. 7, pages 072004, 2015. Aartsen/etal/2015s Aartsen, M.~G. and Abraham, K. and Ackermann, M. and Adams, J. and Aguilar, J.~A. and Ahlers, M. and Ahrens, M. and Altmann, D. and Anderson, T. and et al.. The IceCube Neutrino Observatory, the Pierre Auger Observatory and the Telescope Array: Joint Contribution to the 34th International Cosmic Ray Conference (ICRC 2015). In ArXiv e-prints, 2015. Aartsen/etal/2015t Aartsen, M.~G. and Abraham, K. and Ackermann, M. and Adams, J. and Aguilar, J.~A. and Ahlers, M. and Ahrens, M. and Altmann, D. and Anderson, T. and et al.. The IceCube Neutrino Observatory - Contributions to ICRC 2015 Part V: Neutrino Oscillations and Supernova Searches. In ArXiv e-prints, 2015. Aartsen/etal/2015u Aartsen, M.~G. and Ackermann, M. and Adams, J. and Aguilar, J.~A. and Ahlers, M. and Ahrens, M. and Altmann, D. and Anderson, T. and Arguelles, C. and Arlen, T.~C. and et al.. Multipole analysis of IceCube data to search for dark matter accumulated in the Galactic halo. In European Physical Journal C, Vol. 75, pages 20, 2015. Aartsen/etal/2015v Aartsen, M.~G. and Abraham, K. and Ackermann, M. and Adams, J. and Aguilar, J.~A. and Ahlers, M. and Ahrens, M. and Altmann, D. and Anderson, T. and Archinger, M. and et al.. Evidence for Astrophysical Muon Neutrinos from the Northern Sky with IceCube. In Physical Review Letters, Vol. 115, No. 8, pages 081102, 2015. Aartsen/etal/2015w Aartsen, M.~G. and Abraham, K. and Ackermann, M. and Adams, J. and Aguilar, J.~A. and Ahlers, M. and Ahrens, M. and Altmann, D. and Anderson, T. and et al.. The IceCube Neutrino Observatory - Contributions to ICRC 2015 Part V: Neutrino Oscillations and Supernova Searches. In ArXiv e-prints, 2015. Abchiche/etal/2015a CTA Consortium, T. and : and Abchiche, A. and Abeysekara, U. and Abril, Ó. and Acero, F. and Acharya, B.~S. and Actis, M. and Agnetta, G. and Aguilar, J.~A. and et al.. CTA Contributions to the 34th International Cosmic Ray Conference (ICRC2015). In ArXiv e-prints, 2015. Ahnen/etal/2015c Ahnen, M.~L. and Neise, D. and Balbo, M. and Bergmann, M. and Biland, A. and Bretz, T. and Brügge, K.~A. and Buss, J. and Dorner, D. and Einecke, S. and Freiwald, J. and Hempfling, C. and Hildebrand, D. and Hughes, G. and Lustermann, W. and Mannheim, K. and Meier, K. and Müller, S. and Neronov, A. and Noethe, M. and Overkemping, A.~K. and Paravac, A. and Pauss, F. and Rhode, W. and Temme, F. and Thaele, J. and Toscano, S. and Vogler, P. and Walter, R. and Wilbert, A.. FACT - Performance of the First SiPM camera. In Borisov, A.~S. and Denisova, V.~G. and Guseva, Z.~M. and Kanevskaya, E.~A. and Kogan, M.~G. and Morozov, A.~E. and Puchkov, V.~S. and Pyatovsky, S.~E. and Shoziyoev, G.~P. and Smirnova, M.~D. and Vargasov, A.~V. and Galkin, V.~I. and Nazarov, S.~I. and Mukhamedshin, R.~A. (editors), 34th International Cosmic Ray Conference (ICRC2015), Vol. 34, pages 706, 2015. Ahnen/etal/2015f Ahnen, M.~L. and Balbo, M. and Bergmann, M. and Biland, A. and Bretz, T. and Buß, J. and Dorner, D. and Einecke, S. and Freiwald, J. and Hempfling, C. and Hildebrand, D. and Hughes, G. and Lustermann, W. and Lyard, E. and Mannheim, K. and Meier, K. and Mueller, S. and Neise, D. and Neronov, A. and Overkemping, A.-K. and Paravac, A. and Pauss, F. and Rhode, W. and Steinbring, T. and Temme, F. and Thaele, J. and Toscano, S. and Vogler, P. and Walter, R. and Wilbert, A.. Data compression for the first G-APD Cherenkov Telescope. In Astronomy and Computing, Vol. 12, pages 191-199, 2015. Aleksic/etal/2015b Aleksi\'c, J. and Ansoldi, S. and Antonelli, L.~A. and Antoranz, P. and Babic, A. and Bangale, P. and Barrio, J.~A. and Becerra González, J. and Bednarek, W. and Bernardini, E. and Biasuzzi, B. and Biland, A. and Blanch, O. and Bonnefoy, S. and Bonnoli, G. and Borracci, F. and Bretz, T. and Carmona, E. and Carosi, A. and Colin, P. and Colombo, E. and Contreras, J.~L. and Cortina, J. and Covino, S. and da Vela, P. and Dazzi, F. and de Angelis, A. and de Caneva, G. and de Lotto, B. and de Oña Wilhelmi, E. and Delgado Mendez, C. and Dominis Prester, D. and Dorner, D. and Doro, M. and Einecke, S. and Eisenacher, D. and Elsaesser, D. and Fidalgo, D. and Fonseca, M.~V. and Font, L. and Frantzen, K. and Fruck, C. and Galindo, D. and García López, R.~J. and Garczarczyk, M. and Garrido Terrats, D. and Gaug, M. and Godinovi\'c, N. and González Muñoz, A. and Gozzini, S.~R. and Hadasch, D. and Hanabata, Y. and Hayashida, M. and Herrera, J. and Hildebrand, D. and Hose, J. and Hrupec, D. and Idec, W. and Kadenius, V. and Kellermann, H. and Knoetig, M.~L. and Kodani, K. and Konno, Y. and Krause, J. and Kubo, H. and Kushida, J. and La Barbera, A. and Lelas, D. and Lewandowska, N. and Lindfors, E. and Lombardi, S. and Longo, F. and López, M. and López-Coto, R. and López-Oramas, A. and Lorenz, E. and Lozano, I. and Makariev, M. and Mallot, K. and Maneva, G. and Mannheim, K. and Maraschi, L. and Marcote, B. and Mariotti, M. and Martínez, M. and Mazin, D. and Menzel, U. and Miranda, J.~M. and Mirzoyan, R. and Moralejo, A. and Munar-Adrover, P. and Nakajima, D. and Neustroev, V. and Niedzwiecki, A. and Nilsson, K. and Nishijima, K. and Noda, K. and Orito, R. and Overkemping, A. and Paiano, S. and Palatiello, M. and Paneque, D. and Paoletti, R. and Paredes, J.~M. and Paredes-Fortuny, X. and Persic, M. and Poutanen, J. and Prada Moroni, P.~G. and Prandini, E. and Puljak, I. and Reinthal, R. and Rhode, W. and Ribó, M. and Rico, J. and Rodriguez Garcia, J. and Rügamer, S. and Saito, T. and Saito, K. and Satalecka, K. and Scalzotto, V. and Scapin, V. and Schultz, C. and Schweizer, T. and Sillanpää, A. and Sitarek, J. and Snidaric, I. and Sobczynska, D. and Spanier, F. and Stamerra, A. and Steinbring, T. and Storz, J. and Strzys, M. and Takalo, L. and Takami, H. and Tavecchio, F. and Temnikov, P. and Terzi\'c, T. and Tescaro, D. and Teshima, M. and Thaele, J. and Tibolla, O. and Torres, D.~F. and Toyama, T. and Treves, A. and Vogler, P. and Will, M. and Zanin, R. and MAGIC Collaboration and D'Ammando, F. and Buson, S. and Lähteenmäki, A. and Tornikoski, M. and Hovatta, T. and Readhead, A.~C.~S. and Max-Moerbeck, W. and Richards, J.~L.. Probing the very high energy $\gamma$-ray spectral curvature in the blazar PG 1553+113 with the MAGIC telescopes. In \mnras, Vol. 450, pages 4399-4410, 2015. Aleksic/etal/2015c Aleksi\'c, J. and Ansoldi, S. and Antonelli, L.~A. and Antoranz, P. and Babic, A. and Bangale, P. and Barres de Almeida, U. and Barrio, J.~A. and Becerra González, J. and Bednarek, W. and Rhode, W. and et al.. Unprecedented study of the broadband emission of Mrk 421 during flaring activity in March 2010. In \aap, Vol. 578, pages A22, 2015. Aleksic/etal/2015d Aleksi\'c, J. and Ansoldi, S. and Antonelli, L.~A. and Antoranz, P. and Babic, A. and Bangale, P. and Barrio, J.~A. and Becerra González, J. and Bednarek, W. and Bernardini, E. and Biasuzzi, B. and Biland, A. and Blanch, O. and Bonnefoy, S. and Bonnoli, G. and Borracci, F. and Bretz, T. and Carmona, E. and Carosi, A. and Colin, P. and Colombo, E. and Contreras, J.~L. and Cortina, J. and Covino, S. and Da Vela, P. and Dazzi, F. and De Angelis, A. and De Caneva, G. and De Lotto, B. and de Oña Wilhelmi, E. and Delgado Mendez, C. and Di Pierro, F. and Dominis Prester, D. and Dorner, D. and Doro, M. and Einecke, S. and Eisenacher, D. and Elsaesser, D. and Fernández-Barral, A. and Fidalgo, D. and Fonseca, M.~V. and Font, L. and Frantzen, K. and Fruck, C. and Galindo, D. and García López, R.~J. and Garczarczyk, M. and Garrido Terrats, D. and Gaug, M. and Godinovi\'c, N. and González Muñoz, A. and Gozzini, S.~R. and Hadasch, D. and Hanabata, Y. and Hayashida, M. and Herrera, J. and Hose, J. and Hrupec, D. and Idec, W. and Kadenius, V. and Kellermann, H. and Knoetig, M.~L. and Kodani, K. and Konno, Y. and Krause, J. and Kubo, H. and Kushida, J. and La Barbera, A. and Lelas, D. and Lewandowska, N. and Lindfors, E. and Lombardi, S. and Longo, F. and López, M. and López-Coto, R. and López-Oramas, A. and Lorenz, E. and Lozano, I. and Makariev, M. and Mallot, K. and Maneva, G. and Mannheim, K. and Maraschi, L. and Marcote, B. and Mariotti, M. and Martínez, M. and Mazin, D. and Menzel, U. and Miranda, J.~M. and Mirzoyan, R. and Moralejo, A. and Munar-Adrover, P. and Nakajima, D. and Neustroev, V. and Niedzwiecki, A. and Nievas Rosillo, M. and Nilsson, K. and Nishijima, K. and Noda, K. and Orito, R. and Overkemping, A. and Paiano, S. and Palatiello, M. and Paneque, D. and Paoletti, R. and Paredes, J.~M. and Paredes-Fortuny, X. and Persic, M. and Poutanen, J. and Prada Moroni, P.~G. and Prandini, E. and Puljak, I. and Reinthal, R. and Rhode, W. and Ribó, M. and Rico, J. and Rodriguez Garcia, J. and Saito, T. and Saito, K. and Satalecka, K. and Scalzotto, V. and Scapin, V. and Schultz, C. and Schweizer, T. and Shore, S.~N. and Sillanpää, A. and Sitarek, J. and Snidaric, I. and Sobczynska, D. and Stamerra, A. and Steinbring, T. and Strzys, M. and Takalo, L. and Takami, H. and Tavecchio, F. and Temnikov, P. and Terzi\'c, T. and Tescaro, D. and Teshima, M. and Thaele, J. and Torres, D.~F. and Toyama, T. and Treves, A. and Vogler, P. and Will, M. and Zanin, R. and Berger, K. and Buson, S. and D'Ammando, F. and Gasparrini, D. and Hovatta, T. and Max-Moerbeck, W. and Readhead, A. and Richards, J.. MAGIC detection of short-term variability of the high-peaked BL Lac object 1ES 0806+524. In \mnras, Vol. 451, pages 739-750, 2015. Biland/etal/2015a Biland, A. and Ahnen, M.~L. and Balbo, M. and Bergmann, M. and Bretz, T. and Brügge, K.~A. and Buss, J. and Dorner, D. and Einecke, S. and Freiwald, J. and Hempfling, C. and Hildebrand, D. and Hughes, G. and Lustermann, W. and Mannheim, K. and Meier, K. and Müller, S. and Neise, D. and Neronov, A. and Noethe, M. and Overkemping, A.~K. and Paravac, A. and Pauss, F. and Rhode, W. and Temme, F. and Thaele, J. and Toscano, S. and Vogler, P. and Walter, R. and Wilbert, A.. FACT - Status and Experience from Three Years Operation of the First SiPM Camera. In Borisov, A.~S. and Denisova, V.~G. and Guseva, Z.~M. and Kanevskaya, E.~A. and Kogan, M.~G. and Morozov, A.~E. and Puchkov, V.~S. and Pyatovsky, S.~E. and Shoziyoev, G.~P. and Smirnova, M.~D. and Vargasov, A.~V. and Galkin, V.~I. and Nazarov, S.~I. and Mukhamedshin, R.~A. (editors), 34th International Cosmic Ray Conference (ICRC2015), Vol. 34, pages 1032, 2015. Bockermann/etal/2015a Bockermann, Christian and Brügge, Kai and Buß, Jens and Egorov, Alexey and Morik, Katharina and Rhode, Wolfgang and Ruhe, Tim. Online Analysis of High-Volume Data Streams in Astroparticle Physics. In European Conference on Machine Learning (ECML PKDD 2015), Industrial Track, Springer, 2015. Boerner/etal/2015a Börner, Mathis and Rhode, Wolfgang and Ruhe, Tim and Morik, Katharina. Discovering Neutrinos through Data Analytics. In European Conference on Machine Learning (ECML PKDD 2015), Springer, 2015. Bruegge/etal/2015a Brügge, K.~A. and Ahnen, M.~L. and Balbo, M. and Bergmann, M. and Buss, J. and Biland, A. and Bockermann, C. and Bretz, T. and Dorner, D. and Freiwald, J. and Einecke, S. and Toscano, S. and Thaele, J. and Temme, F. and Hempfling, C. and Hildebrand, D. and Hughes, G. and Lustermann, W. and Mannheim, K. and Meier, K. and Morik, K. and Neise, D. and Müller, S. and Neronov, A. and Noethe, M. and Overkemping, A.~K. and Paravac, A. and Pauss, F. and Walter, R. and Rhode, W. and Wilbert, A. and Vogler, P.. FACT-Tools: Streamed Real-Time Data Analysis. In International Cosmic Ray Conference (ICRC 2015), 2015. Bruegge/etal/2015b Brügge, K.~A. and Ahnen, M.~L. and Balbo, M. and Bergmann, M. and Buss, J. and Biland, A. and Bockermann, C. and Bretz, T. and Dorner, D. and Freiwald, J. and Einecke, S. and Toscano, S. and Thaele, J. and Temme, F. and Hempfling, C. and Hildebrand, D. and Hughes, G. and Lustermann, W. and Mannheim, K. and Meier, K. and Morik, K. and Neise, D. and Müller, S. and Neronov, A. and Noethe, M. and Overkemping, A.~K. and Paravac, A. and Pauss, F. and Walter, R. and Rhode, W. and Wilbert, A. and Vogler, P.. FACT-Tools: Streamed Real-Time Data Analysis. In Borisov, A.~S. and Denisova, V.~G. and Guseva, Z.~M. and Kanevskaya, E.~A. and Kogan, M.~G. and Morozov, A.~E. and Puchkov, V.~S. and Pyatovsky, S.~E. and Shoziyoev, G.~P. and Smirnova, M.~D. and Vargasov, A.~V. and Galkin, V.~I. and Nazarov, S.~I. and Mukhamedshin, R.~A. (editors), 34th International Cosmic Ray Conference (ICRC2015), Vol. 34, pages 865, 2015. Buss/etal/2015a Buss, Jens and Ahnen, M.L. and Balbo, M. and Bergmann, M. and Biland, Adrian and Bockermann, Christian and Bretz, Thomas and Brügge, K. A. and Dorner, Daniela and Einecke, Sabrina and Freiwald, Jan and Hempfling, Christina and Hildebrand, D. and Hughes, Gareth and Lustermann, Werner and Mannheim, Karl and Meier, K. and Morik, Katharina and Müller, Sebastian and Neise, Dominik and Neronov, A. and Nöthe, Max and Rhode, Wolfgang and Temme, Fabian and Thaele, Julia and Toscano, Simona and Vogler, Patrick and Walter, Roland and Wilbert, A.. FACT -- Influence of SiPM Crosstalk on the Performance of an Operating Cherenkov Telescope. In Proceedings, 34th International Cosmic Ray Conference (ICRC 2015), Vol. 34, No. 1130, pages 863, The Hague, 2015. Collaboration/2015a IceCube Collaboration. Unfolding measurement of the Atmospheric Muon Neutrino Spectrum using IceCube-79/86. In Proceedings, 34th International Cosmic Ray Conference (ICRC 2015), 2015. Collaboration/etal/2015a ANTARES Collaboration and Adrián-Martínez, S. and Albert, A. and André, M. and Anton, G. and Ardid, M. and Aubert, J.-J. and Baret, B. and Barrios-Martí, J. and Basa, S. and et al.. First combined search for neutrino point-sources in the Southern Hemisphere with the ANTARES and IceCube neutrino telescopes. In ArXiv e-prints, 2015. Dermer/etal/2015a Dermer, C.~D. and Yan, D. and Zhang, L. and Finke, J.~D. and Lott, B.. Near-equipartition Jets with Log-parabola Electron Energy Distribution and the Blazar Spectral-index Diagrams. In \apj, Vol. 809, pages 174, 2015. Dorner/etal/2015a Dorner, D. and Ahnen, M.~L. and Balbo, M. and Bergmann, M. and Biland, A. and Bretz, T. and Brügge, K.~A. and Buss, J. and Einecke, S. and Freiwald, J. and Hempfling, C. and Hildebrand, D. and Hughes, G. and Lustermann, W. and Mannheim, K. and Meier, K. and Müller, S. and Neise, D. and Neronov, A. and Noethe, M. and Overkemping, A.~K. and Paravac, A. and Pauss, F. and Rhode, W. and Temme, F. and Thaele, J. and Toscano, S. and Vogler, P. and Walter, R. and Wilbert, A.. FACT - TeV Flare Alerts Triggering Multi-Wavelength Observations. In Borisov, A.~S. and Denisova, V.~G. and Guseva, Z.~M. and Kanevskaya, E.~A. and Kogan, M.~G. and Morozov, A.~E. and Puchkov, V.~S. and Pyatovsky, S.~E. and Shoziyoev, G.~P. and Smirnova, M.~D. and Vargasov, A.~V. and Galkin, V.~I. and Nazarov, S.~I. and Mukhamedshin, R.~A. (editors), 34th International Cosmic Ray Conference (ICRC2015), Vol. 34, pages 704, 2015. Dorner/etal/2015b Dorner, D. and Ahnen, M.~L. and Bergmann, M. and Biland, A. and Balbo, M. and Bretz, T. and Buss, J. and Einecke, S. and Freiwald, J. and Hempfling, C. and Hildebrand, D. and Hughes, G. and Lustermann, W. and Mannheim, K. and Meier, K. and Mueller, S. and Neise, D. and Neronov, A. and Overkemping, A.-K. and Paravac, A. and Pauss, F. and Rhode, W. and Steinbring, T. and Temme, F. and Thaele, J. and Toscano, S. and Vogler, P. and Walter, R. and Wilbert, A.. FACT - Monitoring Blazars at Very High Energies. In ArXiv e-prints, 2015. Mueller/etal/2015a Müller, S. and Ahnen, M.~L. and Balbo, M. and Bergmann, M. and Biland, A. and Bretz, T. and Buss, J. and Dorner, D. and Einecke, S. and Freiwald, J. and Hempfling, C. and Hildebrand, D. and Hughes, G. and Lustermann, W. and Mannheim, K. and Meier, K. and Neise, D. and Neronov, A. and Noethe, M. and Overkemping, A.~K. and Paravac, A. and Pauss, F. and Rhode, W. and Temme, F. and Thaele, J. and Toscano, S. and Vogler, P. and Walter, R. and Wilbert, A.. FACT - Novel mirror alignment using Bokeh and enhancement of the VERITAS SCCAN alignment method. In Borisov, A.~S. and Denisova, V.~G. and Guseva, Z.~M. and Kanevskaya, E.~A. and Kogan, M.~G. and Morozov, A.~E. and Puchkov, V.~S. and Pyatovsky, S.~E. and Shoziyoev, G.~P. and Smirnova, M.~D. and Vargasov, A.~V. and Galkin, V.~I. and Nazarov, S.~I. and Mukhamedshin, R.~A. (editors), 34th International Cosmic Ray Conference (ICRC2015), Vol. 34, pages 976, 2015. Noethe/etal/2015b Noethe, M. and Ahnen, M.~L. and Balbo, M. and Bergmann, M. and Biland, A. and Bockermann, C. and Bretz, T. and Brügge, K.~A. and Buss, J. and Dorner, D. and Einecke, S. and Freiwald, J. and Hempfling, C. and Hildebrand, D. and Hughes, G. and Lustermann, W. and Mannheim, K. and Meier, K. and Morik, K. and Müller, S. and Neise, D. and Neronov, A. and Overkemping, A.~K. and Paravac, A. and Pauss, F. and Rhode, W. and Temme, F. and Thaele, J. and Toscano, S. and Vogler, P. and Walter, R. and Wilbert, A.. FACT - Calibration of Imaging Atmospheric Cerenkov Telescopes with Muon Rings. In Borisov, A.~S. and Denisova, V.~G. and Guseva, Z.~M. and Kanevskaya, E.~A. and Kogan, M.~G. and Morozov, A.~E. and Puchkov, V.~S. and Pyatovsky, S.~E. and Shoziyoev, G.~P. and Smirnova, M.~D. and Vargasov, A.~V. and Galkin, V.~I. and Nazarov, S.~I. and Mukhamedshin, R.~A. (editors), 34th International Cosmic Ray Conference (ICRC2015), Vol. 34, pages 733, 2015. Rando/etal/2015a Rando, R. and Corti, D. and Dazzi, F. and De Angelis, A. and Dettlaff, A. and Dorner, D. and Fink, D. and Fouque, N. and Grundner, F. and Haberer, W. and Hahn, A. and Hermel, R. and Korpar, S. and Kukec Mezek, G. and Maier, R. and Manea, C. and Mariotti, M. and Mazin, D. and Mehrez, F. and Mirzoyan, R. and Podkladkin, S. and Reichardt, I. and Rhode, W. and Rosier, S. and Schultz, C. and Stella, C. and Teshima, M. and Wetteskind, H. and Zavrtanik, M. and CTA Consortium, f.~t.. Silicon Photomultiplier Research and Development Studies for the Large Size Telescope of the Cherenkov Telescope Array. In ArXiv e-prints, 2015. Temme/etal/2015b Temme, F. and Ahnen, M.~L. and Balbo, M. and Bergmann, M. and Biland, A. and Bockermann, C. and Bretz, T. and Brügge, K.~A. and Buss, J. and Dorner, D. and Einecke, S. and Freiwald, J. and Hempfling, C. and Hildebrand, D. and Hughes, G. and Lustermann, W. and Mannheim, K. and Meier, K. and Morik, K. and Müller, S. and Neise, D. and Neronov, A. and Noethe, M. and Overkemping, A.~K. and Paravac, A. and Pauss, F. and Rhode, W. and Thaele, J. and Toscano, S. and Vogler, P. and Walter, R. and Wilbert, A.. FACT - First Energy Spectrum from a SiPM Cherenkov Telescope. In Borisov, A.~S. and Denisova, V.~G. and Guseva, Z.~M. and Kanevskaya, E.~A. and Kogan, M.~G. and Morozov, A.~E. and Puchkov, V.~S. and Pyatovsky, S.~E. and Shoziyoev, G.~P. and Smirnova, M.~D. and Vargasov, A.~V. and Galkin, V.~I. and Nazarov, S.~I. and Mukhamedshin, R.~A. (editors), 34th International Cosmic Ray Conference (ICRC2015), Vol. 34, pages 707, 2015. Aartsen/etal/2014a Aartsen, M. G. and Abbasi, R. and Abdou, Y. and Ackermann, M. and Adams, J. and Aguilar, J. A. and Ahlers, M. and Altmann, D. and Auffenberg, J. and Bai, X. and et al.. Improvement in fast particle track reconstruction with robust statistics. In Nuclear Instruments and Methods in Physics Research A, Vol. 736, pages 143-149, 2014. Aartsen/etal/2014c IceCube Collaboration and Morik, Katharina. Development of a General Analysis and Unfolding Scheme and its Application to Measure the Energy Spectrum of Atmospheric Neutrinos with IceCube. In European Physical Journal C, 2014. Aartsen/etal/2014e Aartsen, M.~G. and Ackermann, M. and Adams, J. and Aguilar, J.~A. and Ahlers, M. and Ahrens, M. and Altmann, D. and Anderson, T. and Arguelles, C. and Arlen, T.~C. and et al.. Observation of High-Energy Astrophysical Neutrinos in Three Years of IceCube Data. In Physical Review Letters, Vol. 113, No. 10, pages 101101, 2014. Aleksic/etal/2014a Aleksic, J. and Ansoldi, S. and Antonelli, L. A. and Antoranz, P. and Babic, A. and Bangale, P. and Barres de Almeida, U. and Barrio, J. A. and Becerra González, J. and Bednarek, W. and et al.. Optimized dark matter searches in deep observations of Segue 1 with MAGIC. In Journal of Cosmology and Astroparticle Physics, No. 2, pages 008, 2014. Aleksic/etal/2014b Aleksic, J. and Antonelli, L. A. and Antoranz, P. and Babic, A. and Barres de Almeida, U. and Barrio, J. A. and Becerra González, J. and Bednarek, W. and Berger, K. and Bernardini, E. and et al.. Rapid and multiband variability of the TeV bright active nucleus of the galaxy IC 310. In Astronomy & Astrophysics, Vol. 563, id.A91, pages 9+, 2014. Duivesteijn/Thaele/2014a Duivesteijn, Wouter and Thaele, Julia. Understanding Where Your Classifier Does (Not) Work - the SCaPE Model Class for Exceptional Model Mining. No. 9, TU Dortmund, 2014. Voigt/etal/2012a Tobias Voigt and Roland Fried and Michael Backes and Wolfgang Rhode. Threshold Optimization for Classification in Imbalanced Data in a problem of gamma-ray astronomy. In Advances in Data Analysis and Classification, Vol. DOI 10.1007/s11634-014-0167-5, 2014. Voigt/Fried/2014a Voigt, Tobias and Fried, Roland. Distance based Feature Construction in a setting of astronomy. In Lausen, Berthold and Krolak-Schwerdt, Sabine and Boehmer, Matthias (editors), Proceedings of the ECDA 2013, Springer, 2014.
cation. In Proceedings of the IWSM 2014, 2014. Zelo/2014a Zelo, Ieva. Periodenfindung in rot verrauschten Zeitreihen. In Masterthesis, 2014. Aartsen/etal/2013a Aartsen, M.G. and Abbasi, R. and Abdou, Y. and Ackermann, M. and Adams, J. and Aguilar, J.A. and Ahler, M. and Altmann, D. and Andeen, K. and Auffenberg, J. and et al.. Observation of Cosmic-Ray Anisotropy with the IceTop Air Shower Array. In The Astrophysical Journal, Vol. 765, No. 1, pages 55, 2013. Aartsen/etal/2013b Aartsen, M.G. and Abbasi, R. and Abdou, Y. and Ackermann, M. and Adams, J. and Aguilar, J.A. and Ahlers, M. and Altmann, D. and Andeen, K. and Auffenberg, J. and et al.. Search for Galactic PeV gamma rays with the IceCube Neutrino Observatory. In Physical Review D, Vol. 87, No. 6, pages 062002, 2013. Aartsen/etal/2013c Aartsen, M.G. and Abbasi, R. and Abdou, Y. and Ackermann, M. and Adams, J. and Aguilar, J.A. and Ahlers, M. and Altmann, D. and Auffenberg, J. and Bai, X and et al.. Search for Dark Matter Annihilations in the Sun with the 79-String IceCube Detector. In Physical Review Letters, Vol. 110, No. 13, pages 131302, 2013. Aartsen/etal/2013d Aartsen, M.G. and Abbasi, R. and Abdou, Y. and Ackermann, M. and Adams, J. and Aguilar, J.A. and Ahlers, M. and Altmann, D. and Auffenberg, J. and Bai, X. and et al.. Measurement of the Atmospheric $v_e$ Flux in IceCube. In Physical Review Letters, Vol. 110, No. 15, pages 151105, 2013. Aartsen/etal/2013e Aartsen, M.G. and Abbasi, R. and Abdou, Y. and Ackermann, M. and Adams, J. and Aguilar, J.A. and Ahlers, M. and Altmann, D. and Auffenberg, J. and Bai, X. and et al.. Measurement of South Pole ice transparency with the IceCube LED calibration system. In Nuclear Instruments and Methods in Physics Research A, Vol. 711, pages 73-89, 2013. Aartsen/etal/2013f Aartsen, M. G. and Abbasi, R. and Abdou, Y. and Ackermann, M. and Adams, J. and Aguilar, J. A. and Ahlers, M. and Altmann, D. and Auffenberg, J. and Bai, X. and et al.. First Observation of PeV-Energy Neutrinos with IceCube. In Physical Review Letters, Vol. 111, No. 2, pages 021103, 2013. Aartsen/etal/2013g Aartsen, M. G. and Abbasi, R. and Abdou, Y. and Ackermann, M. and Adams, J. and Aguilar, J. A. and Ahlers, M. and Altmann, D. and Auffenberg, J. and Bai, X. and et al.. Measurement of Atmospheric Neutrino Oscillations with IceCube. In Physical Review Letters, Vol. 111, No. 8, pages 081801, 2013. Aartsen/etal/2013h Aartsen, M. G. and Abbasi, R. and Abdou, Y. and Ackermann, M. and Adams, J. and Aguilar, J. A. and Ahlers, M. and Altmann, D. and Auffenberg, J. and Bai, X. and et al.. Search for Time-independent Neutrino Emission from Astrophysical Sources with 3 yr of IceCube Data. In The Astrophysical Journal, Vol. 779, No. 2, Article id. 132, pages 17+, 2013. Abbasi/etal/2013a Abbasi, R. and Abdou, Y. and Ackermann, M. and Adams, J. and Aguilar, J.A. and Ahlers, M. and Altmann, D. and Andeen, K. and Auffenberg, J. and Bai, X. and et al.. Lateral distribution of muons in IceCube cosmic ray events. In Physical Review D, Vol. 87, No. 1, pages 012005+, 2013. Abbasi/etal/2013b Abbasi, R. and Abdou, Y. and Ackermann, M. and Adams, J. and Aguilar, J.A. and Ahlers, M. and Altmann, D. and Andeen, K. and Auffenberg, J. and Bai, X. and et al.. Search for relativistic magnetic monopoles with IceCube. In Physical Review D, Vol. 87, No. 2, pages 022001, 2013. Abbasi/etal/2013c Abbasi, R. and Abdou, Y. and Ackermann, M. and Adams, J. and Aguilar, J.A. and Ahlers, M. and Altmann, D. and Andeen, K. and Auffenberg, J. and Bai, X. and et al.. IceTop: The surface component of IceCube.. In Nuclear Instruments and Methods in Physics Research A, Vol. 700, pages 188-220, 2013. Abbasi/etal/2013d Abbasi, R. and Abdou, Y. and Ackermann, M. and Adams, J. and Aguilar, J.~A. and Ahlers, M. and Altmann, D. and Andeen, K. and Auffenberg, J. and Bai, X. and et al.. An improved method for measuring muon energy using the truncated mean of dE/dx. In Nuclear Instruments and Methods in Physics Research A, Vol. 703, pages 190-198, 2013. Abbasi/etal/2013e Abbasi, R. and Abdou, Y. and Abu-Zayyad, T. and Ackermann, M. and Adams, J. and Aguilar, J.A. and Ahlers, M. and Altmann, D. and Andeen, K. and Auffenberg, J. and et al.. All-particle cosmic ray energy spectrum measured with 26 IceTop stations. In Astroparticle Physics, Vol. 44, pages 40-58, 2013. Aleksic/etal/2013a Aleksic, J. and Antonelli, L.A. and Antoranz, P. and Asensio, M. and Barres de Almeida, U. and Barrio, J.A. and Becerra Gonzalez, J. and Bednarek, W. and Berger, K. and Bernardini, E. and et al.. Observations of the magnetars 4U 0142+61 and 1E 2259+586 with the MAGIC telescopes. In Astronomy & Astrophysics, Vol. 549, pages A23+, 2013. Aleksic/etal/2013b Aleksic, J. and Antonelli, L.A. and Antoranz, P. and Asensio, M. and Backes, M. and Barres de Almeida, U. and Barrio, J.A. and Becerra González, J. and Bednarek, W. and Berger, K. and et al.. Very high energy gamma-ray observation of the peculiar transient event Swift J1644+57 with the MAGIC telescopes and AGILE. In Astronomy & Astrophysics, Vol. 552, No. A112, pages 6 pp., 2013. IceCubeCollaboration/etal/2013a IceCube Collaboration and Abbasi, R. and Abdou, Y. and Ackermann, M. and Adams, J. and Aguilar, J.A. and Ahlers, M. and Altmann, D. and Andeen, K. and Auffenberg, J. and et al.. Searches for High-energy Neutrino Emission in the Galaxy with the Combined ICECUBE-AMANDA Detector. In The Astrophysical Journal, Vol. 763, No. 1, pages 33+, 2013. IceCubeCollaboration/etal/2013b The IceCube Collaboration and Abbasi, R. and Abdou, Y. and Ackermann, M. and Adams, J. and Aguilar, J.A. and Ahlers, M. and Altmann, D. and Andeen, K. and Auffenberg, J. and et al.. Cosmic ray composition and energy spectrum from 1-30 PeV using the 40-string configuration of IceTop and IceCube. In Astroparticle Physics, Vol. 42, pages 15-32, 2013. Koehne/etal/2013a Koehne, J.-H. and Frantzen, K. and Schmitz, M. and Fuchs, T. and Rhode, W. and Chirkin, D. and Becker Tjus, J.. PROPOSAL: A tool for propagation of charged leptons. In Computer Physics Communications, Vol. 184, pages 2070-2090, 2013. Milke/etal/2013a Milke, N. and Doert, M. and Klepser, S. and Mazin, D. and Blobel, V. and Rhode, W.. Solving inverse problems with the unfolding program TRUEE: Examples in astroparticle physics. In Nuclear Instruments and Methods in Physics Research A, Vol. 697, pages 133-147, 2013. Ruhe/2013c Ruhe, Tim and others. Measurement of the Atmospheric \(\nu_\mu\) Spectrum with IceCube 59. In International Cosmic Ray Conference (ICRC 2013), 2013. Ruhe/etal/2013a Ruhe, Tim and Morik, Katharina and Rhode, Wolfgang. Application of RapidMiner in Neutrino Astronomy. In Hofmann, Markus and Klinkenberg, Ralf (editors), RapidMiner: Data Mining Use Cases and Business Analytics Applications, CRCPress Book, 2013. Ruhe/etal/2013b Ruhe, Tim and Schmitz, Martin and Voigt, Tobias and Wornowizki, Max. DSEA: A Data Mining Approach to Unfolding. In International Cosmic Ray Conference (ICRC 2013), 2013. Thieler/etal/2013a Thieler, Anita Monika and Backes, Michael and Fried, Roland and Rhode, Wolfgang. Periodicity detection in irregularly sampled light curves by robust regression and outlier detection. In Statistical Analysis and Data Mining, Vol. 6, pages 73-89, 2013. Thieler/etal/2013b Thieler, Anita Monika and Fried, Roland and Rathjens, Jonathan. RobPer: An R Package to Calculate Periodograms for Light Curves Based On Robust Regression. No. 2, TU Dortmund University, 2013. Voigt/etal/2013a Tobias Voigt and Roland Fried and Michael Backes and Wolfgang Rhode. Gamma-Hadron-Separation in the MAGIC Experiment. In Spiliopoulou, Myra and Schmidt-Thieme, Lars and Janning, Ruth (editors), Data Analysis, Machine Learning and Knowledge Discovery, Springer, 2013. Wornowizki/Fried/2013a Wornowizki, Max and Fried, Roland. Two-sample homogeneity tests based on divergence measures. In Computational Statistics, 2013. Yildiz/2013a Yildiz, Pinar. Die SCRAM-Methode in der Anwendung auf unterschiedliche Datensätze und Arbeitsfelder. In Bachelor Thesis, 2013. Abbasi/etal/2012a Abbasi, R. and Abdou, Y. and Abu-Zayyad, T. and Adams, J. and Aguilar, J.A. and Ahlers, M. and Andeen, K. and Auffenberg, J. and Bai, X. and Baker, M. and et al.. Time-dependent Searches for Point Sources of Neutrinos with the 40-string and 22-string Configurations of IceCube. In The Astrophysical Journal, Vol. 744, pages 1, 2012. Abbasi/etal/2012b Abbasi, R. and Abdou, Y. and Abu-Zayyad, T. and Adams, J. and Aguilar, J.A. and Ahlers, M. and Andeen, K. and Auffenberg, J. and Bai, X. and Baker, M. and et al.. Background studies for acoustic neutrino detection at the South Pole. In Astroparticle Physics, Vol. 35, No. 6, pages 312-324, 2012. Abbasi/etal/2012c Abbasi, R. and Abdou, Y. and Abu-Zayyad, T. and Adams, J. and Aguilar, J.A. and Ahlers, M. and Altmann, D. and Andeen, K. and Auffenberg, J. and Bai, X. and et al.. Neutrino Analysis of the 2010 September Crab Nebula Flare and Time-integrated Constraints on Neutrino Emission from the Crab Using IceCube. In The Astrophysical Journal, Vol. 745, No. 1, pages 45-55, 2012. Abbasi/etal/2012d Abbasi, R. and Abdou, Y. and Abu-Zayyad, T. and Ackermann, M. and Adams, J. and Aguilar, J.A. and Ahlers, M. and Allen, M.M. and Altmann, D. and Andeen, K. and et al.. Observation of Anisotropy in the Galactic Cosmic-Ray Arrival Directions at 400 TeV with IceCube. In Astrophysical Journal, Vol. 746, No. 1, pages 33-43, 2012. Abbasi/etal/2012e Abbasi, R. and Abdou, Y. and Abu-Zayyad, T. and Ackermann, M. and Adams, J. and Andeen, K. and Aguilar, J.A. and Ahlers, M. and Altmann, D. and Auffenberg, J. and et al.. Multiyear search for dark matter annihilations in the Sun with the AMANDA-II and IceCube detectors. In Physical Review D, Vol. 85, No. 4, pages 042002, 2012. Abbasi/etal/2012f Abbasi, R. and Abdou, Y. and Abu-Zayyad, T. and Ackermann, M. and Adams, J. and Aguilar, J.A. and Ahlers, M. and Allen, M.M. and Altmann, D. and Andeen, K. and et al.. Searching for soft relativistic jets in core-collapse supernovae with the IceCube optical follow-up program. In Astronomy & Astrophysics, Vol. 539, pages A60+, 2012. Abbasi/etal/2012g Abbasi, R. and Abdou, Y. and Abu-Zayyad, T. and Ackermann, M. and Adams, J. and Aguilar, J.A. and Ahlers, M. and Allen, M.M. and Altmann, D. and Andeen, K. and et al.. Searches for Periodic Neutrino Emission from Binary Systems with 22 and 40 Strings of IceCube. In The Astrophysical Journal, Vol. 748, No. 2, pages 118, 2012. Abbasi/etal/2012h Abbasi, R. and Abdou, Y. and Abu-Zayyad, T. and Ackermann, M. and Adams, J. and Aguilar, J.A. and Ahlers, M. and Altmann, D. and Andeen, K. and Auffenberg, J. and et al.. An absence of neutrinos associated with cosmic-ray acceleration in $\gamma$-ray bursts. In Nature, Vol. 484, No. 7394, pages 351-354, 2012. Abbasi/etal/2012i Abbasi, R. and Abdou, Y. and Abu-Zayyad, T. and Ackermann, M. and Adams, J. and Aguilar, J.A. and Ahlers, M. and Allen, M.M. and Altmann, D. and Andeen, K. and et al.. The design and performance of IceCube DeepCore. In Astroparticle Physics, Vol. 35, No. 10, pages 615-624, 2012. Abbasi/etal/2012j Abbasi, R. and Abdou, Y. and Abu-Zayyad, T. and Ackermann, M. and Adams, J. and Aguilar, J.A. and Ahlers, M. and Altmann, D. and Andeen, K. and Auffenberg, J. and et al.. Search for ultrahigh-energy tau neutrinos with IceCube. In Physical Review D, Vol. 86, No. 2, pages 022005+, 2012. Abramowski/etal/2012a Abramowski, A. and Acero, F. and Aharonian, F. and Akhperjanian, A.G. and Anton, G. and Balzer, A. and Barnacka, A. and Barres de Almeida, U. and Becherini, Y. and Becker, J. and et al.. The 2010 Very High Energy $\gamma$-Ray Flare and 10 Years of Multi-wavelength Observations of M 87. In Astrophysical Journal, Vol. 746, No. 2, pages 151-168, 2012. Aleksic/etal/2012a Aleksic, J. and Alvarez, E.A. and Antonelli, L.A. and Antoranz, P. and Asensio, M. and Backes, M. and Barrio, J.A. and Bastieri, D. and et al.. Performance of the MAGIC stereo system obtained with Crab Nebula data. In Astroparticle Physics, Vol. 35, No. 7, pages 435-448, 2012. Aleksic/etal/2012b Aleksic, J. and Alvarez, E.A. and Antonelli, L.A. and Antoranz, P. and Asensio, M. and Backes, M. and Barrio, J.A. and Bastieri, D. and Becerra Gonzalez, J. and Bednarek, W. and et al.. Detection of the $\gamma$-Ray Binary LS I +61° 303 in a Low-flux State at Very High Energy $\gamma$-Rays with the MAGIC Telescopes in 2009. In Astrophysical Journal, Vol. 746, No. 1, pages 80-84, 2012. Aleksic/etal/2012c Aleksic, J. and Alvarez, E.A. and Antonelli, L.A. and Antoranz, P. and Asensio, M. and Backes, M. and Barrio, J.A. and Bastieri, D. and Becerra Gonzalez, J. and Bednarek, W. and et al.. Discovery of VHE $\gamma$-ray emission from the BL Lacertae object B3 2247+381 with the MAGIC telescopes. In Astronomy & Astrophysics, Vol. 539, pages A118+, 2012. Aleksic/etal/2012d Aleksic, J. and Alvarez, E.A. and Antonelli, L.A. and Antoranz, P. and Asensio, M. and Backes, M. and Barres de Almeida, U. and Barrio, J.A. and Bastieri, D. and Becerra Gonzalez, J. and et al.. Detection of very-high energy $\gamma$-ray emission from NGC 1275 by the MAGIC telescopes. In Astronomy & Astrophysics, Vol. 539, pages L2+, 2012. Aleksic/etal/2012e Aleksic, J. and Alvarez, E.A. and Antonelli, L.A. and Antoranz, P. and Asensio, M. and Backes, M. and Barrio, J.A. and Bastieri, D. and Becerra Gonzalez, J. and Bednarek, W. and et al.. PG 1553+113: Five Years of Observations with MAGIC. In The Astrophysical Journal, Vol. 748, No. 1, pages 46+, 2012. Aleksic/etal/2012f Aleksic, J. and Alvarez, E.A. and Antonelli, L.A. and Antoranz, P. and Asensio, M. and Backes, M. and Barrio, J.A. and Bastieri, D. and Becerra Gonzalez, J. and Bednarek, W. and et al.. Phase-resolved energy spectra of the Crab pulsar in the range of 50-400 GeV measured with the MAGIC telescopes. In Astronomy & Astrophysics, Vol. 540, pages A69+, 2012. Aleksic/etal/2012g Aleksic, J. and Alvarez, E.A. and Antonelli, L.A. and Antoranz, P. and Asensio, M. and Backes, M. and Barres de Almeida, U. and Barrio, J.A. and Bastieri, D. and Becerra Gonzalez, J. and et al.. Morphological and spectral properties of the W51 region measured with the MAGIC telescopes. In Astronomy & Astrophysics, Vol. 541, pages A13+, 2012. Aleksic/etal/2012i Aleksic, J. and Alvarez, E.A. and Antonelli, L.A. and Antoranz, P. and Asensio, M. and Backes, M. and Barres de Almeida, U. and Barrio, J.A. and Bastieri, D. and Becerra Gonzalez, J. and et al.. Constraining cosmic rays and magnetic fields in the Perseus galaxy cluster with TeV observations by the MAGIC telescopes. In Astronomy & Astrophysics, Vol. 541, pages A99+, 2012. Aleksic/etal/2012j Aleksic, J. and Alvarez, E.A. and Antonelli, L.A. and Antoranz, P. and Asensio, M. and Backes, M. and Barrio, J.A. and Bastieri, D. and Becerra Gonzalez, J. and Bednarek, W. and et al.. Mrk 421 active state in 2008: the MAGIC view, simultaneous multi-wavelength observations and SSC model constrained. In Astronomy & Astrophysics, Vol. 542, pages A100, 2012. Aleksic/etal/2012k Aleksic, J. and Alvarez, E.A. and Antonelli, L.A. and Antoranz, P. and Asensio, M. and Backes, M. and Barres de Almeida, U. and Barrio, J.A. and Bastieri, D. and Becerra Gonzalez, J. and et al.. Detection of VHE $\gamma$-Rays from HESS J0632+057 during the 2011 February X-Ray Outburst with the MAGIC Telescopes. In The Astrophysical Journal Letters, Vol. 754, No. 1, pages L10, 2012. Aleksic/etal/2012l Aleksic, J. and Alvarez, E.A. and Antonelli, L.A. and Antoranz, P. and Asensio, M. and Backes, M. and Barres de Almeida, U. and Barrio, J.A. and Bastieri, D. and Becerra Gonzalez, J. and et al.. High zenith angle observations of PKS 2155-304 with the MAGIC-I telescope. In Astronomy & Astrophysics, Vol. 544, pages A75, 2012. Aleksic/etal/2012m Aleksic, J. and Alvarez, E.A. and Antonelli, L.A. and Antoranz, P. and Asensio, M. and Backes, M. and Barrio, J.A. and Bastieri, D. and Becerra Gonzalez, J. and Bednarek, W. and et al.. MAGIC observations of the giant radio galaxy M 87 in a low-emission state between 2005 and 2007. In Astronomy & Astrophysics, Vol. 544, pages A96, 2012. Aleksic/etal/2012n Aleksic, J. and Alvarez, E.A. and Antonelli, L.A. and Antoranz, P. and Ansoldi, S. and Asensio, M. and Backes, M. and Barres de Almeida, U. and Barrio, J.A. and Bastieri, D. and et al.. Discovery of VHE $\gamma$-rays from the blazar 1ES 1215+303 with the MAGIC telescopes and simultaneous multi-wavelength observations. In Astronomy & Astrophysics, Vol. 544, pages A142+, 2012. Bockermann/Blom/2012a Christian Bockermann and Hendrik Blom. Processing Data Streams with the RapidMiner Streams-Plugin. In RapidMiner Community Meeting and Conference, 2012. Bockermann/Blom/2012c Christian Bockermann and Hendrik Blom. The Streams Framework. No. 5, TU Dortmund, 2012. Bretz/etal/2012a Bretz, T. and Dorner, D. and Backes, M. and Biland, A. and Buß, J. and Commichau, V. and Djambazov, L. and Eisenacher, D. and Grimm, O. and von Gunten, H. and et al.. FACT - The first G-APD Cherenkov telescope (first results). In Aharonian, F.A. and Hofmann, W. and Rieger, F.M. (editors), American Institute of Physics Conference Series, Vol. 1505, pages 773-776, 2012. Fried/Raabe/2012a Fried, Roland and Raabe, Nils and Thieler, Anita. On the robust analysis of periodic nonstationary time series. In Colubi, Ana and Fokianos, Konstantinos and Kontoghiorghes, Erricos John and González-Rodríguez, Gil (editors), Proceedings of COMPSTAT 2012, pages 245--257, The International Statistical Institute/International Association for Statistical Computing, 2012. Kraehenbuehl/etal/2012a Krähenbühl, T. and Anderhub, H. and Backes, M. and Biland, A. and Boller, A. and Braun, I. and Bretz, T. and Commichau, V. and Djambazov, L. and Dorner, D. and et al.. G-APDs in Cherenkov astronomy: The FACT camera. In Nuclear Instruments and Methods in Physics Research A, Vol. 695, pages 96-99, 2012. Abbasi/etal/2011a Abbasi, R. and Abdou, Y. and Abu-Zayyad, T. and Actis, O. and Adams, J. and Aguilar, J.~A. and Ahlers, M. and Andeen, K. and Auffenberg, J. and Bai, X. and et al.. Search for neutrino-induced cascades with five years of AMANDA data. In Astroparticle Physics, Vol. 34, pages 420-430, 2011. Abbasi/etal/2011b Abbasi, R. and Abdou, Y. and Abu-Zayyad, T. and Adams, J. and Aguilar, J.~A. and Ahlers, M. and Andeen, K. and Auffenberg, J. and Bai, X. and Baker, M. and et al.. Measurement of the atmospheric neutrino energy spectrum from 100 GeV to 400 TeV with IceCube. In Physical Review D, Vol. 83, No. 1, pages 012001-+, 2011. Abbasi/etal/2011c Abbasi, R. and Abdou, Y. and Abu-Zayyad, T. and Adams, J. and Aguilar, J.~A. and Ahlers, M. and Andeen, K. and Auffenberg, J. and Bai, X. and Baker, M. and et al.. Limits on Neutrino Emission from Gamma-Ray Bursts with the 40 String IceCube Detector. In Physical Review Letters, Vol. 106, No. 14, pages 141101-+, 2011. Abbasi/etal/2011d Abbasi, R. and Abdou, Y. and Abu-Zayyad, T. and Adams, J. and Aguilar, J.~A. and Ahlers, M. and Andeen, K. and Auffenberg, J. and Bai, X. and Baker, M. and et al.. Time-integrated Searches for Point-like Sources of Neutrinos with the 40-string IceCube Detector. In The Astrophysical Journal, Vol. 732, pages 18-+, 2011. Abbasi/etal/2011e Abbasi, R. and Abdou, Y. and Abu-Zayyad, T. and Adams, J. and Aguilar, J.~A. and Ahlers, M. and Andeen, K. and Auffenberg, J. and Bai, X. and Baker, M. and et al.. Constraints on the extremely-high energy cosmic neutrino flux with the IceCube 2008-2009 data. In Physical Review D, Vol. 83, No. 9, pages 092003-+, 2011. Abbasi/etal/2011f Abbasi, R. and Abdou, Y. and Abu-Zayyad, T. and Adams, J. and Aguilar, J.~A. and Ahlers, M. and Andeen, K. and Auffenberg, J. and Bai, X. and Baker, M. and et al.. Search for dark matter from the Galactic halo with the IceCube Neutrino Telescope. In Physical Review D, Vol. 84, No. 2, pages 022004-+, 2011. Abbasi/etal/2011g Abbasi, R. and Abdou, Y. and Abu-Zayyad, T. and Adams, J. and Aguilar, J.~A. and Ahlers, M. and Altmann, D. and Andeen, K. and Auffenberg, J. and Bai, X. and et al.. Observation of Anisotropy in the Arrival Directions of Galactic Cosmic Rays at Multiple Angular Scales with IceCube. In The Astrophysical Journal, Vol. 740, pages 16-+, 2011. Abbasi/etal/2011h Abbasi, R. and Abdou, Y. and Abu-Zayyad, T. and Adams, J. and Aguilar, J.~A. and Ahlers, M. and Andeen, K. and Auffenberg, J. and Bai, X. and Baker, M. and et al.. Erratum: Constraints on the extremely-high energy cosmic neutrino flux with the IceCube 2008-2009 data [Phys. Rev. D 83, 092003 (2011)]. In Physical Review D, Vol. 84, No. 7, pages 079902, 2011. Abbasi/etal/2011i Abbasi, R. and Abdou, Y. and Abu-Zayyad, T. and Adams, J. and Aguilar, J.~A. and Ahlers, M. and Altmann, D. and Andeen, K. and Auffenberg, J. and Bai, X. and et al.. Search for a diffuse flux of astrophysical muon neutrinos with the IceCube 40-string detector. In Physical Review D, Vol. 84, No. 8, pages 082001, 2011. Abbasi/etal/2011j Abbasi, R. and Abdou, Y. and Abu-Zayyad, T. and Ackermann, M. and Adams, J. and Aguilar, J.~A. and Ahlers, M. and Allen, M.~M. and Altmann, D. and Andeen, K. and et al.. IceCube sensitivity for low-energy neutrinos from nearby supernovae. In American Academy of Pediatrics, Vol. 535, pages A109, 2011. Abbasi/etal/2011l Abbasi, R. and Abdou, Y. and Abu-Zayyad, T. and Adams, J. and Aguilar, J.~A. and Ahlers, M. and Andeen, K. and Auffenberg, J. and Bai, X. and Baker, M. and et al.. First search for atmospheric and extraterrestrial neutrino-induced cascades with the IceCube detector. In Physical Review D, Vol. 84, No. 7, pages 072001, 2011. Aleksic/etal/2011a Aleksic, J. and Antonelli, L.A. and Antoranz, P. and Backes, M. and Barrio, J.A. and Bastieri, D. and Becerra Gonzalez, J. and Bednarek, W. and Berdyugin, A. and Berger, K. and et al.. Observations of the Blazar 3C 66A with the Magic Telescopes in Stereoscopic Mode. In The Astrophysical Journal, Vol. 726, pages 58-+, 2011. Aleksic/etal/2011b Aleksic, J. and Antonelli, L.A. and Antoranz, P. and Backes, M. and Baixeras, C. and Barrio, J.A. and Bastieri, D. and Becerra Gonzalez, J. and Bednarek, W. and Berdyugin, A. and et al.. Gamma-ray Excess from a Stacked Sample of High- and Intermediate-frequency Peaked Blazars Observed with the MAGIC Telescope. In The Astrophysical Journal, Vol. 729, No. 2, pages 115-+, 2011. Aleksic/etal/2011c Aleksic, J. and Antonelli, L.A. and Antoranz, P. and Backes, M. and Barrio, J.A. and Bastieri, D. and Becerra Gonzalez, J. and Bednarek, W. and Berdyugin, A. and Berger, K. and et al.. MAGIC Discovery of Very High Energy Emission from the FSRQ PKS 1222+21. In The Astrophysical Journal Letters, Vol. 730, No. 1, pages L8+, 2011. Aleksic/etal/2011d Aleksic, J. and Antonelli, L.A. and Antoranz, P. and Backes, M. and Barrio, J.A. and Bastieri, D. and Becerra Gonzalez, J. and Bednarek, W. and Berdyugin, A. and Berger, K. and et al.. MAGIC Observations and multiwavelength properties of the quasar 3C 279 in 2007 and 2009. In Astronomy & Astrophysics, Vol. 530, pages A4+, 2011. Aleksic/etal/2011e Aleksic, J. and Alvarez, E.A. and Antonelli, L.A. and Antoranz, P. and Asensio, M. and Backes, M. and Barrio, J.A. and Bastieri, D. and Becerra Gonzalez, J. and Bednarek, W. and et al.. A Search for Very High Energy Gamma-Ray Emission from Scorpius X-1 with the Magic Telescopes. In The Astrophysical Journal Letters, Vol. 735, No. 1, pages L5+, 2011. Aleksic/etal/2011f Aleksic, J. and Alvarez, E.A. and Antonelli, L.A. and Antoranz, P. and Asensio, M. and Backes, M. and Barrio, J.A. and Bastieri, D. and Becerra Gonzalez, J. and Bednarek, W. and et al.. Searches for dark matter annihilation signatures in the Segue 1 satellite galaxy with the MAGIC-I telescope. In Journal of Cosmology and Astroparticle Physics, Vol. 6, pages 35-+, 2011. Aleksic/etal/2011g Aleksic, J. and Alvarez, E.A. and Antonelli, L.A. and Antoranz, P. and Asensio, M. and Backes, M. and Barrio, J.A. and Bastieri, D. and Becerra Gonzalez, J. and Bednarek, W. and et al.. Observations of the Crab Pulsar between 25 and 100 GeV with the MAGIC I Telescope. In The Astrophysical Journal, Vol. 742, No. 1, pages 43, 2011. Anderhub/etal/2011a Anderhub, H. and Backes, M. and Biland, A. and Boller, A. and Braun, I. and Bretz, T. and Commichau, S. and Commichau, V. and Dorner, D. and Gendotti, A. and et al.. A G-APD based Camera for Imaging Atmospheric Cherenkov Telescopes. In Nuclear Instruments and Methods in Physics Research A, Vol. 628, pages 107-110, 2011. Anderhub/etal/2011c Anderhub, H. and Backes, M. and Biland, A. and Boller, A. and Braun, I. and Bretz, T. and Commichau, S. and Commichau, V. and Domke, M. and Dorner, D. and et al.. FACT - The first Cherenkov telescope using a G-APD camera for TeV gamma-ray astronomy. In Nuclear Instruments and Methods in Physics Research A, Vol. 639, pages 58-61, 2011. Collaboration/etal/2011a Icecube Collaboration and Abbasi, R. and Abdou, Y. and Abu-Zayyad, T. and Adams, J. and Aguilar, J.~A. and Ahlers, M. and Andeen, K. and Auffenberg, J. and Bai, X. and et al.. Measurement of acoustic attenuation in South Pole ice. In Astroparticle Physics, Vol. 34, pages 382-393, 2011. Fried/Dehling/2011a Fried,R. and Dehling, H.. Robust nonparametric tests for the two-sample location problem. In Statistical Methods and Applications, 2011. IceCubeCollaboration/etal/2011a IceCube Collaboration and Abbasi, R. and Abdou, Y. and Abu-Zayyad, T. and Adams, J. and Aguilar, J.~A. and Ahlers, M. and Andeen, K. and Auffenberg, J. and Bai, X. and et al.. Constraints on high-energy neutrino emission from SN 2008D. In American Academy of Pediatrics, Vol. 527, pages A28+, 2011. Ruhe/etal/2011a Ruhe, Tim and Morik, Katharina and Schowe,Benjamin. Data Mining on Ice. In Sarro, Luis and Bailer-Jones, Coryn and Eyer, Laurent and O'Mullane, William and de Ridder, Joris (editors), Procs. of the Workshop on Astrostatistics and Data Mining in Large Astronomical Databases, 2011. Ruhe/etal/2011b Ruhe, Tim and Morik, Katharina and Rhode, Wolfgang. Data Mining Ice Cubes. In Gabriel, Carlos et alii (editors), Astronomical Data Analysis Software and Systems, 2011. Abbasi/etal/2013c - IceTop: The surface component of IceCube. Thaele/2018a J. Thaele. The Quest for Very High Energy Gamma-Rays -- A Comparative Study of \(\gamma\)-Hadron Separations and Analysis of Crab Nebula Data Measured by the First G-APD Cherenkov Telescope. TU Dortmund, 2018. Fuchs/2016a Tomasz Fuchs. Charmante Myonen im Eis. TU Dortmund, 2016. Temme/2016a F. Temme. On the Hunt for Photons: Analysis of Crab Nebula Data Obtained by the First G-APD Cherenkov Telescope. TU Dortmund, 2016. Bockermann/2015a Bockermann, Christian. Mining Big Data Streams for Multiple Concepts. TU Dortmund, 2015. Frantzen/2015a Frantzen, Katharina. Von der Monte-Carlo-Produktion zur Datenanalyse. TU Dortmund, 2015. Overkemping/2015a Overkemping, A.. Messages from a Black Hole - A long-term analysis of the Active Galactic Nucleus Markarian 421 in the light of ?-rays measured by MAGIC-I. Technische Universität Dortmund, Dortmund, Germany, 2015. Thieler/2014a Anita M. Thieler. Robuste Verfahren zur Periodendetektion in ungleichmäßig beobachteten Lichtkurven. TU Dortmund, 2014. Doert/2013a M. Doert. The talkative AGN next door. Technische Universität Dortmund, Dortmund, Germany, 2013. Koehne/2013a J.H. Koehne. Der Leptonpropagator PROPOSAL. Technische Universität Dortmund, Dortmund, Germany, 2013. Ntiwa/2013a A. Ntiwa Foudjo. Robust normality test and robust power transformation with application to state change detection in non-normal processes. TU Dortmund, 2013. Ruhe/2013a T. Ruhe. Data Mining on the Rocks -- A Measurement of the Atmospheric Neutrino Flux using IceCube in the 59-string Configuration and a Novel Data Mining Based Approach to Unfolding. TU Dortmund, 2013. Milke/2012a Natalie Milke. Unfolding of the atmospheric neutrino flux spectrum with the new program TRUEE and IceCube. TU Dortmund, 2012. Morell/2012a O. Morell. On nonparametric methods for robust jump-preserving smoothing and trend detection. TU Dortmund, 2012. Bunse/2018a Bunse, Mirko. DSEA Rock-Solid -- Regularization and Comparison with other Deconvolution Algorithms. TU Dortmund, 44221 Dortmund, Germany, 2018. Senz/2018a Senz, Martin. Effiziente kernelbasierte Klassifikation von Teleskop-Daten durch die Anwendung der Nyström Approximation. TU Dortmund, 2018. Roetner/2017a Rötner, Stefan. Deep Learning on Raw Telescope Data. 2017. Schmidt/2017a Schmidt, Maik. Datenzusammenfassungen auf Datenströmen. 2017. Baack/2016b D. Baack. Speedup CORSIKA -- Laufzeitreduzierung durch frühzeitige Entfernung nicht benötigter Partikel. TU Dortmund, 2016. Egorov/2016a Egorov, Alexey. Distributed Stream Processing with the Intention of Mining. TU Dortmund, 2016. Boerner/2014a Boerner, M.. Der Entfaltungsalgorithmus DSEA - Systematische Studien und Anwendung auf eine astrophysikalische Fragestellung. TU Dortmund, 2014. Downar/2014a Lennart Downar. A Rank Correlation Model Class for Exceptional Model Mining. TU Dortmund, 2014. Abbas/2013a S. Abbas. Detektion von Nanoobjekten in Graustufenbildern und Bildsequenzen mittels robuster Zeitreihenmethoden zur Strukturbrucherkennung. TU Dortmund, 2013. Buss/2013a Buss, J.. FACT - Signal Calibration: Gain Calibration and Development of aSingele Photon Pulse Template for the FACT Camera. TU Dortmund, 2013. Deiters/2013a F. Deiters. Glättung und Image Cleaning im FACT Experiment. TU Dortmund, 2013. Wulf/2013a Wulf, Niklas. Speicherung und Analyse von BigData am Beispiel der Daten des FACT Teleskops. 2013. Bulinski/2012a Bulinski, Michael. Parallelisierung von Clusteralgorithmen. Faculty of Computer Science, TU Dortmund University, 2012. Fuchs/2012a Fuchs, T.. Leptonpropagation mit PROPOSAL unter Verwendung von Grafikprozessoren. Technische Universität Dortmund, 2012. Rathjens/2012a J. Rathjens. Robuste Regressionsmethoden im Sinusmodell. TU Dortmund, 2012. Bruegge/2011a Brügge, Kai. Analyse von IceCube-Daten und Vergleich von Voting-Mechanismen für Random Forest. Technische Universität Dortmund, 2011. Helf/2011a Helf, Marius. Gamma-Hadron-Separation im MAGIC-Experiment durch verteilungsgestütztes Sampling. TU Dortmund, 2011. Wornowizki/2011a Wornowizki, Max. Variablenselektion über Filterverfahren auf Daten des Neutrinodetektors IceCube. TU Dortmund, 2011. Voigt/2010a Voigt, T.. Exploration und Vorverarbeitung von MAGIC-Daten zur Gamma-Hadron-Separation. Technische Universit"at Dortmund, 2010. Abbasi/etal/2010a Abbasi, R. and Rhode, W. and et al.. The Energy Spectrum of Atmospheric Neutrinos between 2 and 200 TeV with the AMANDA-II Detector. In Astroparticle Physics, Vol. 34, pages 48-58, 2010. Schettlinger/etal/2010a K. Schettlinger and R. Fried and U. Gather. Real Time Signal Processing by Adaptive Repeated Median Filters. In International Journal of Adaptive Control and Signal Processing, Vol. 24, No. 5, pages 346--362, 2010. Thieler/etal/2010a A.~M. Thieler and M. Backes and R. Fried and W. Rhode. Period Search in Unevenly Sampled Data. No. 2010/1, TU~Dortmund, Fakultät Statistik, 2010. Aliu/etal/2009a E. Aliu and others. Improving the performance of the single-dish Cherenkov telescope MAGIC through the use of signal timing. In Astroparticle Physics, Vol. 30, pages 293--305, 2009. Anderhub/etal/2009a Anderhub, H. and et al.. A novel camera type for very high energy gamma-ray astronomy based on Geiger-mode avalanche photodiodes. In Journal of Instrumentation, Vol. 4, No. 10, pages P10010, 2009. Nunkesser/etal/2009a R. Nunkesser and R. Fried and K. Schettlinger and U. Gather. Online anlysis of time series by the Qn-estimator. In Computational Statistics and Data Analysis (special issue on computational econometrics), Vol. 53, No. 6, pages 2354--2362, 2009. Thieler/2009a A.~M. Thieler. Filtermethoden auf Basis robuster Regression zur Glättung von Graustufenbildern. Fakultät Statistik, TU~Dortmund, 2009. Achterberg/etal/2007a A. Achterberg and others. Five years of searches for point sources of astrophysical neutrinos with the AMANDA-II neutrino telescope. In Physical Review D, Vol. 75, No. 10, pages 102001, 2007. Albert/etal/2007b J. Albert and others. Unfolding of differential energy spectra in the MAGIC experiment. In Nuclear Instruments and Methods in Physics Research A, Vol. 583, pages 494-506, 2007. Fried/2007a R. Fried. On the Robust Detection of Edges in Time Series Filtering. In Computational Statistics & Data Analysis, Vol. 52, No. 2, pages 1063--1074, 2007. Fried/etal/2007a R. Fried and J. Einbeck and U. Gather. Weighted repeated median smoothing and filtering. In Journal of the American Statistical Association, Vol. 480, pages 1300--1308, 2007. Bernholt/etal/2006a T. Bernholt and R. Fried and U. Gather and I. Wegener. Modified repeated median filters. In Statistics and Computing, Vol. 16, No. 2, pages 177--192, Hingham, MA, USA, Kluwer Academic Publishers, 2006. Ahrens/etal/2004a J. Ahrens and others. Muon track reconstruction and data selection techniques in AMANDA. In Nuclear Instruments and Methods in Physics Research A, Vol. 524, pages 169-194, 2004. Becker/Fried/2002a C. Becker and R. Fried. Sliced Inverse Regression for High-Dimensional Time Series. In Opitz, O. and Schwaiger, M. (editors), Exploratory Data Analysis in Empirical Research, pages 3--12, Berlin, Springer, 2002.